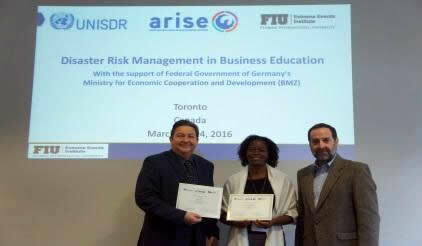 The United Nations Office for Disaster Risk Reduction has been focusing in business resilience and strengthening the private sector disaster risk reduction (DRR) initiatives in the Caribbean: Recently, Haiti and Saint Lucia launched their ARISE National Networks, combined to a DRR training, and the regional chambers of commerce gathered in Barbados to launch a joint network. 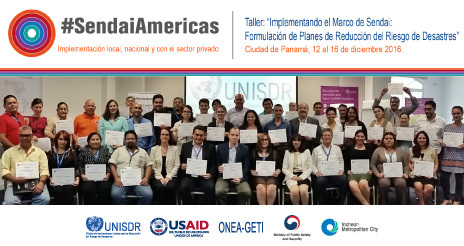 More than 45 representatives from 13 countries in the Americas and Caribbean Region joined in Panama City from March 26th to 27th with the purpose to highlight the role and responsibilities of local governments in disaster risk reduction in the Americas and the Caribbean. 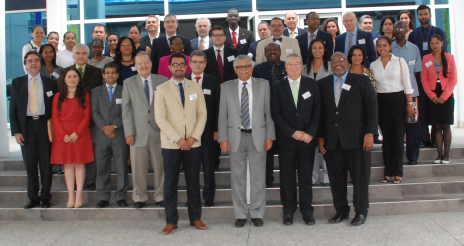 Participants from local and national governments, key stakeholders, advocates of the Global Campaign Making Cities Resilient, national disaster risk management authorities and other organizations from the Americas and the Caribbean region gathered in Panama City to discuss achievements related to Target E of the Sendai Framework for Disaster Risk Reduction 2015-2030. 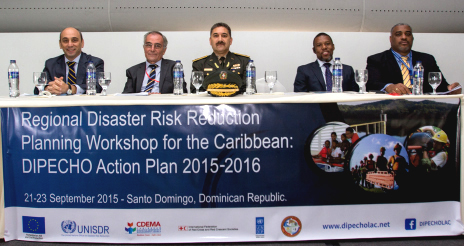 Haiti is at a turning point in its strategic engagement for disaster risk reduction (DRR). The country is preparing to adopt a Revised National Plan for Disaster and Risk Management, 20 years after the first one was adopted. In addition, a law is in discussion to provide more capacity and autonomy to the Directorate for Civil Protection (DPC). 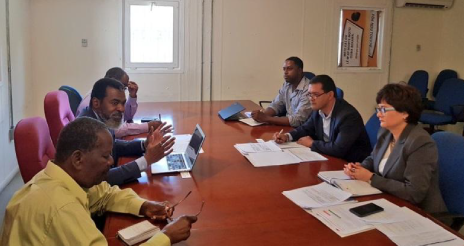 At the same time, Haiti is aiming to embrace several initiatives at regional and global level and to participate in the main international events in DRR where it will have to show the progress achieved while continue on drawing attention on existing vulnerabilities. Recognizing this critical stage, the UN Office for Disaster Risk Reduction is increasing its support to the Government and other stakeholders involved in reducing risk and building resilience in the country. Guyana, St. Lucia and Antigua and Barbuda working on their commitments as part of the Caribbean Safe School Initiative (CSSI) and members of the Worldwide Initiative for School Safety (WISS) demonstrate how the CSSI implementation has increased awareness on school safety among school children, teachers and parents who are making their schools and homes more resilient. 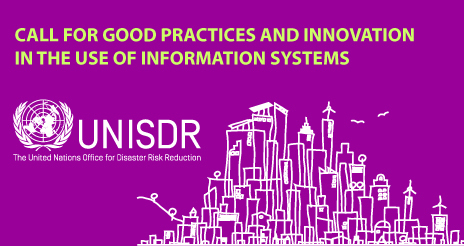 In December 2017 the United Nations Office for Disaster Risk Reduction (UNISDR) launched a call for submission of good practices from the Private Sector in Disaster Risk Reduction (DRR). 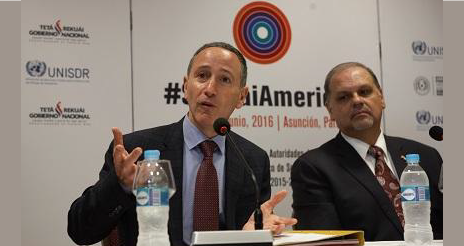 The focus is on how this sector is engaged in DRR in the Americas and the Caribbean region. 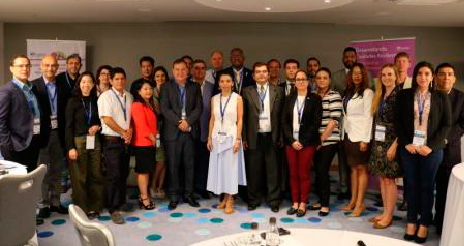 A total of 33 private-sector companies and organizations from North, Central and South America and the Caribbean took part in the conversation, resulting in the systemization of good practices that illustrate how the private sector is contributing to the implementation of DRR and resilience. 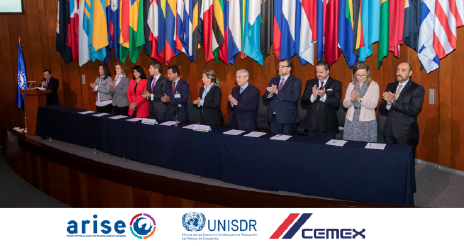 150 Mexican companies and other organizations joined the Private Sector Alliance for Disaster Resilient Societies (ARISE), signing the Declaration of Voluntary Cooperation, which created the first national public-private network to prevent and mitigate disasters in Mexico. 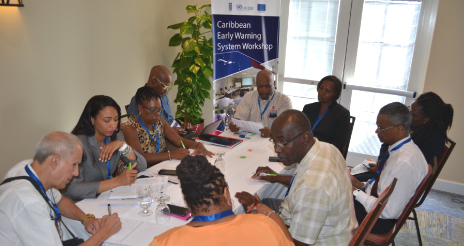 An initiative to strengthen multi-hazard early warning systems in the Caribbean was launched on November 20 during the dry season Caribbean Climate Forum (CariCOF) meeting held in Accra Hotel in Hastings, Barbados. 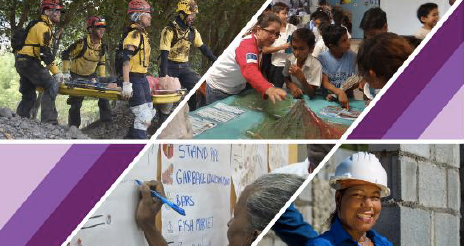 Humanitarian organizations from 17 countries in Latin America and the Caribbean working on disaster preparedness produced the document "Systematization of evidence: disaster preparedness makes a difference", which compiles 60 cases with 70 individual topics to demonstrate the positive impact of disaster preparedness in the region. 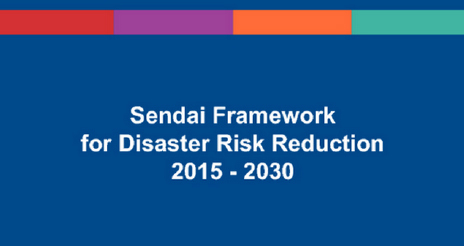 The present report provides an overview of progress in the implementation of the Sendai Framework for Disaster Risk Reduction 2015–2030, as requested by the General Assembly in its resolution 72/218. 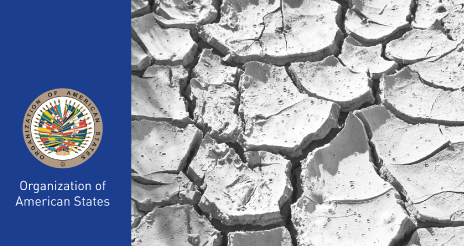 In accordance with Assembly resolution 71/227, the report also includes a section on an effective global response to address the impacts of the El Niño phenomenon. This year's International Day for Disaster Reduction falls shortly after a devastating earthquake and tsunami in Indonesia showed yet again the urgency of resilience and risk-awareness. 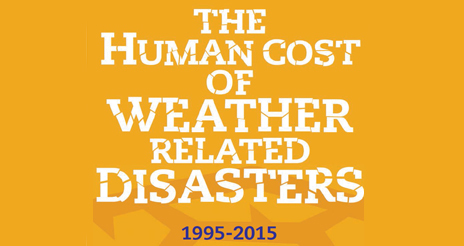 Disasters have a steep human cost. Millions of people are displaced every year, losing their homes and jobs because of extreme weather events and earthquakes. 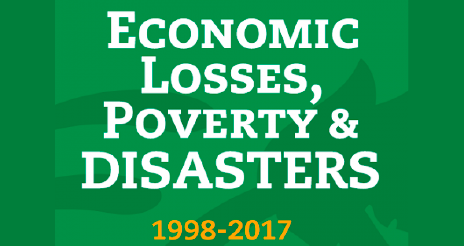 The last twenty years have seen a dramatic rise of 151% in direct economic losses from climate-related disasters, according to a report released today by the UN Office for Disaster Risk Reduction in advance of International Day for Disaster Reduction on October 13. 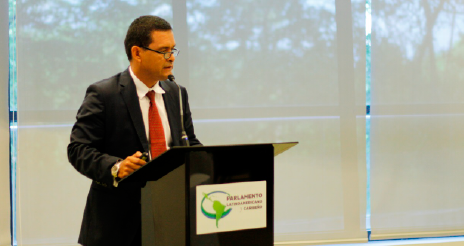 Raúl Salazar, Head of the United Nations Office for Disaster Reduction (UNISDR) for the Americas and the Caribbean participated in the 3rd Gathering of the Parliamentary Network on Climate Change, Fostering Climate Action in the Americas and the Caribbean: The Role of Parliaments within the Climate Agenda, held at the American and Caribbean Parliament in Panama on October 4 and 5, 2018. During his participation, Mr. Raúl Salazar commented that "disaster risk reduction must be considered in the context of the 2030 Agenda and the Sendai Framework for Disaster Reduction as a policy to fight poverty". Was the private sector prepared for the devastating 2017 hurricane season in the Caribbean? The 2017 hurricane season was infamous for ravaging the Caribbean- twice. 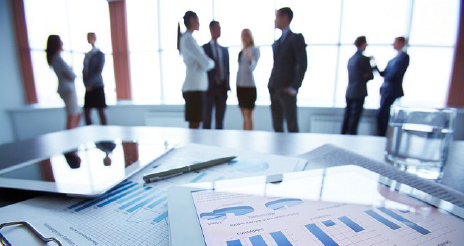 Though considered small in scope, these island nations have active economies and possess private sector entities involved in risk management. These circumstances compelled the question: Was the private sector prepared for the devastating 2017 hurricane season in the Caribbean? This was what the United Nations Office for Disaster Risk Reduction (UNISDR) considered when conducting the "Private Sector Study Preparedness for Enhanced Resilience after Hurricanes Irma and Maria in Dominica and the British Virgin Islands". 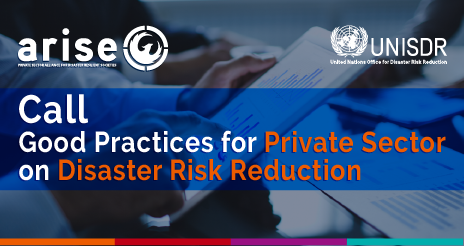 This study provides a space for capturing the experiences of the private sector in disaster risk management (DRM) through actions and ongoing initiatives to enhance resiliencethroughout the Caribbean. 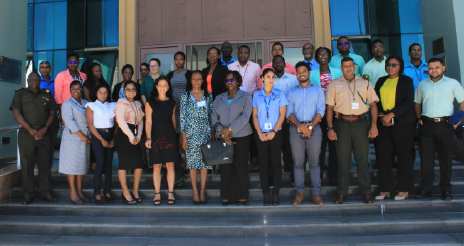 Over the last three days, representatives from various sectors in Guyana gathered to advance in the development of the country's five-year Country Work Programme (CWP) for 2019-2024 for Disaster Risk Reduction and Comprehensive Disaster Management. 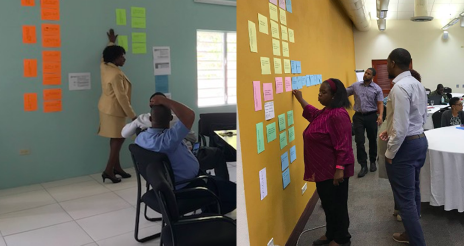 During the months of July and August, Barbados, Saint Lucia as well as Antigua and Barbuda developed Country Work Programme (CWP) Workshops in each country, with the objective of updating the existing multi-year disaster risk management (DRM) work programmes based on identified gaps and priorities. 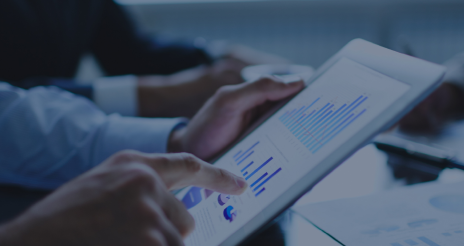 an essential part of the CWP are the Performance Measurement Frameworks using an basket of indicators as basis. 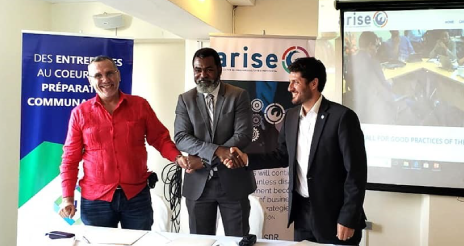 During the first semester of 2018, different members of the private sector of Barbados, British Virgin Islands (BVI) and Dominica have become part of the UNISDR Private Sector Alliance for Disaster Resilient Societies (Arise), by signing the declaration of cooperation and launching the Arise National Network in each country. 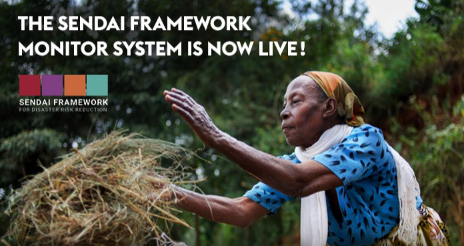 The Sendai Framework recognizes that the private sector is an important stakeholder to promote disaster risk reduction (DRR) and to establish, disseminate and share good practices internationally. Jamaica's hosting of the next Americas disaster risk reduction conference is a "glorious opportunity" to raise awareness of the challenges facing the small island developing states of the Caribbean, said Desmond McKenzie, Minister of Local Government and Community Development. 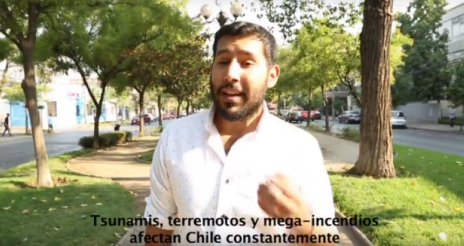 Tsunamis may be rare in the Americas but they do happen as the region is highly seismic prone. 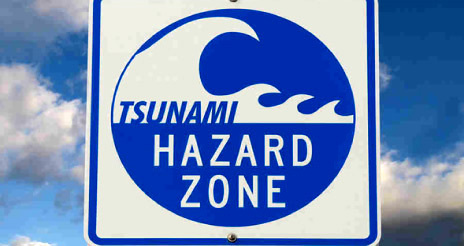 A dozen earthquakes of magnitude 7.0 or greater have occurred in the Caribbean near Puerto Rico, the Virgin Islands, and Hispaniola in the past 500 years generating more than 75 tsunamis. 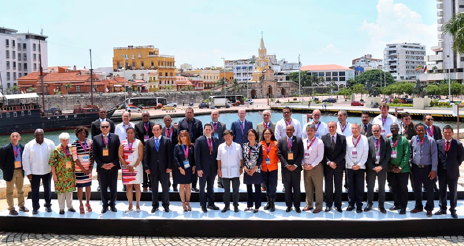 Ministers and senior officials from the Americas and the Caribbean are urging progress on monitoring the region's roadmap for resilience to disasters.. 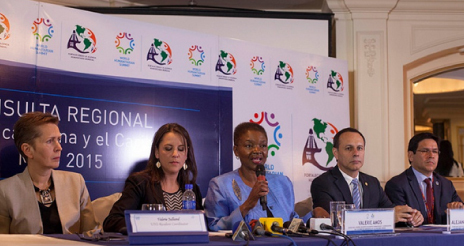 In a declaration at the close of the three-day Vl Regional Platform on Disaster Reduction in the Americas, they said members should integrate disaster risk reduction in all areas of activity to promote a "less vulnerable region" and more resilient communities. 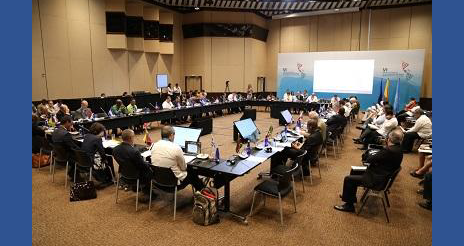 An Americas and Caribbean conference on disaster risk reduction closed with ministers reiterating support for a regional plan to accelerate action against natural and man-made hazards that take a heavy toll each year. 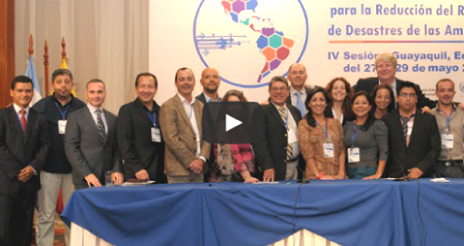 The Vl Regional Platform on Disaster Risk Reduction in the Americas – now officially Americas and the Caribbean – was held June 20-22. It focused on what is needed to meet targets for reducing disaster losses laid out in the global plan, the Sendai Framework for Disaster Risk Reduction 2015-2030. The Sendai Framework is an opportunity to "unleash" science in the service of reducing the risks posed by natural disasters that take so many lives each year, a conference on disaster reduction heard. 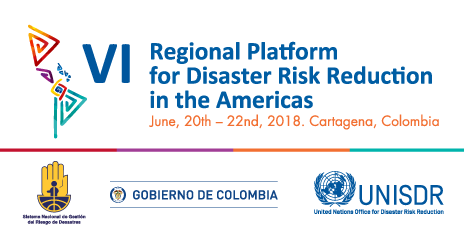 Implementation of the global plan for disaster reduction, which was launched in 2015, and the contribution that academics and scientists can make to attaining its goals are important themes of the Vl Regional Platform on Disaster Reduction in the Americas being held in Colombia. The deadly 2017 hurricanes in the Caribbean posed huge challenges but they also offer opportunities to build better disaster preparedness and response systems, a conference heard. 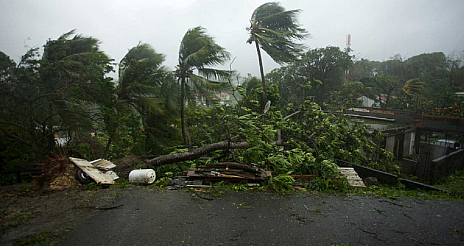 With the region now bracing for the 2018 season, key lessons that emerged from the havoc wrought by hurricanes Irma and Maria, category 5 storms in 2017, include the need for enhanced response capacity for fast-moving, multiple and catastrophic events, and to tackle environmental and development questions, such as building standards and codes for land use and management. 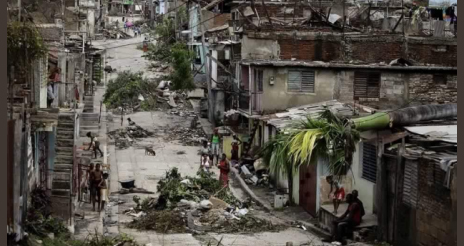 Hurricane Mitch, which in 1988 cut a swathe of destruction across Central America, marked a "before and after" for the region's approach to disaster risk reduction, an international conference heard. 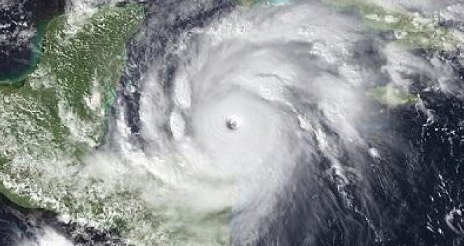 The Category 5 storm, the highest on the international rating, caused over 11,000 deaths, more than 7,000 of them in Honduras. It was the deadliest hurricane in Central America since Hurricane Fifi, which killed slightly fewer people in 1974. 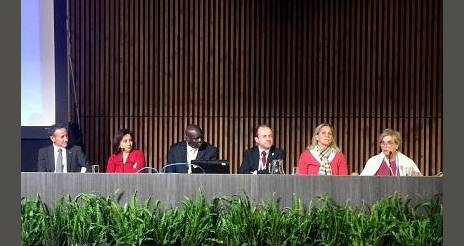 Representatives of five cities in the Americas met this week in Colombia at the Sixth Regional Platform for Disaster Risk Reduction to discuss progress against the Sendai Framework, the global plan to reduce disaster losses by 2030. 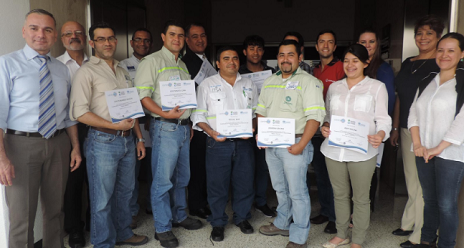 Santo Domingo Este in the Dominican Republic, Guayaquil in Ecuador, Guatemala City in Guatemala, San Juan de Lurigancho in Peru and Tegucigalpa in Honduras are among twenty cities that have been chosen globally to take part in a three-year programme called Making cities sustainable and resilient: Implementing the Sendai framework for Disaster Risk reduction 2015-2030 at the local level, launched in 2016. Effective disaster risk management requires an "inclusive, all-of-society approach" that reflects the views of those who suffer most from such events, the head of the UNISDR told a regional conference on disaster risk reduction. Policy makers must heed the "voices of those who suffer disproportionately in such events. 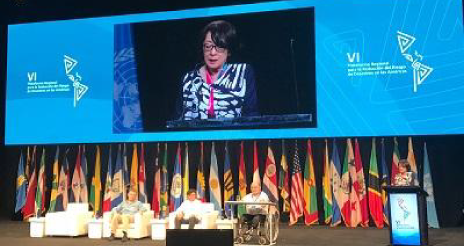 People living with disabilities, older persons, women, children and indigenous groups need to be consulted and engaged," said Mami Mizutori, Special Representative of the UN Secretary-General for Disaster Risk Reduction and head of the UN Office for Disaster Risk Reduction. 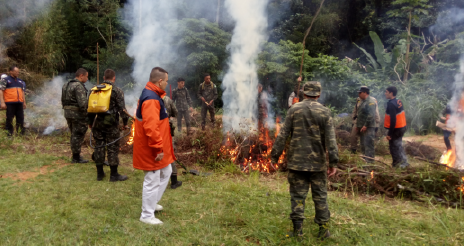 Colombia, one of the world's most vulnerable countries to natural hazards, has made great progress in implementing disaster risk reduction policies, although much remains to be done, President Juan Manuel Santos said today. Addressing the official opening of the three-day Vl Regional Platform for Disaster Risk Reduction in the Americas, President Santos said that this progress could be seen in the country's rapid response to the threat posed by landslides around the Ituango hydroelectric dam project that forced tens of thousands to flee their homes. 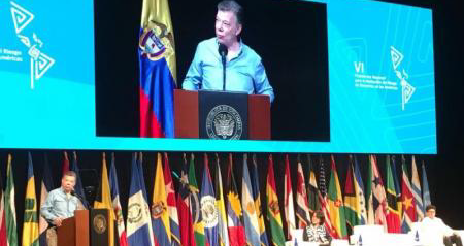 Colombia's President Juan Manuel Santos urged the Americas to work closely together to manage the risks the region's countries face from disasters such as hurricanes, flooding or earthquakes and to build resilience in local communities most exposed to them. 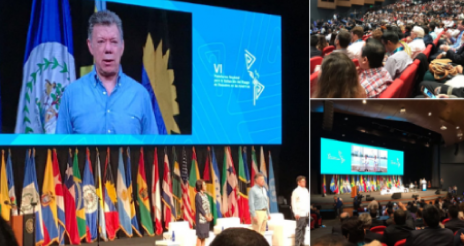 Opening the three-day Vl Regional Platform for Disaster Risk Reduction in the Americas in the historic port city of Cartagena, President Santos said the meeting provided an "amazing opportunity" to share tools and ideas. 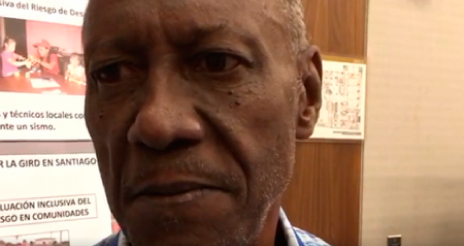 Tichico Joel Cobian Mena was a geologist for 26 years in Santiago de Cuba when he became blind in 2005 after a long and painful ocular disease. 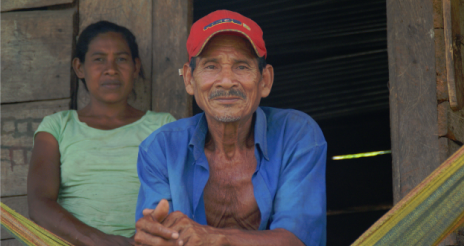 He is now retired but he has put both his knowledge and handicap at the service of the 10,000 disabled people who have been identified among the most vulnerable groups if his region was hit by an earthquake. 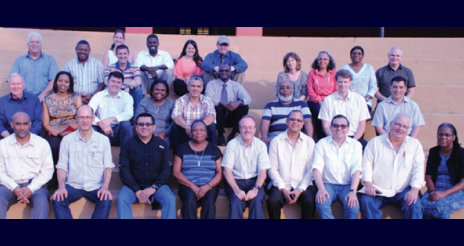 Representatives of eight national institutes of statistics in the Americas continue to meet today in Cartagena, Colombia, to discuss better ways to work together to collect data and statistics to monitor progress on reducing disaster losses as outlined in the Sendai Framework for Disaster Risk Reduction. 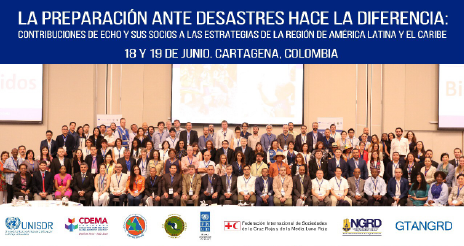 With the objective of illustrating how some preventative actions can make a difference in disaster response and recovery, the Regional Workshop titled "Disaster preparedness makes the difference: Contributions from ECHO and its partners to the strategies in the Latin America and Caribbean region" will be held on the 18th and 19th of June 2018, in the city of Cartagena, Colombia. 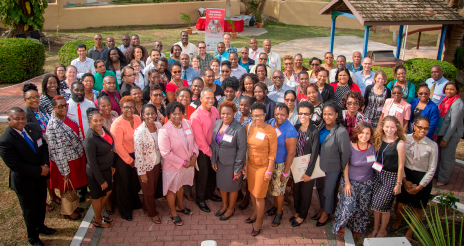 Aimed at taking stock, documenting and sharing lessons learned in the implementation of the education sector emergency response, officials from the education, child protection and disaster management sectors from 14 Caribbean countries joined development partners in Barbados this week at the Caribbean Safe School Initiative (CSS) – Learning Together workshop. This workshop explored future disaster risk reduction and preparedness action and investment in education and child protection systems. 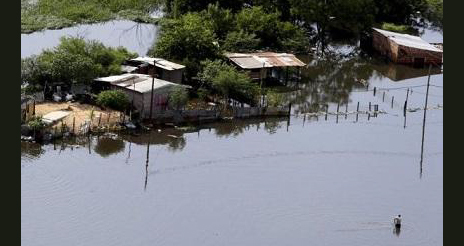 Over a thousand representatives of governments, civil society and the private sector are to meet in Cartagena, Colombia, June 20-22, to discuss the increasing impact of extreme weather events and climate change across the region. A review of the impact of the 2017 Atlantic Hurricane season which set new records for damage and loss in the United States and the Caribbean will be high on the agenda. 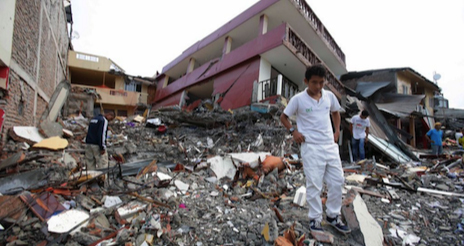 The region sustained record disaster losses last year estimated at over $300 billion including the Mexican earthquakes. The World Trade Organization today called for greater dialogue on the impacts of the growing number of disasters on world trade and the role trade can play in building resilience to disasters. It also announced that its Aid For Trade section will undertake a mapping exercise to capture the experience of disaster-affected members and release a report early next year. The department of the European Commission for Civil Protection and Humanitarian Aid Operations (ECHO), the United Nations Office for Disaster Risk Reduction (UNISDR) together with the partners of the Disaster Preparedness Program of the European Commission in Latin America and the Caribbean (LAC) region are organizing the Regional Workshop Disaster preparedness makes the difference: Contributions from ECHO and its partners to the strategies of the Latin American and Caribbean region, which will be held on June 18th and 19th, 2018 in the Cartagena de Indias, Colombia. 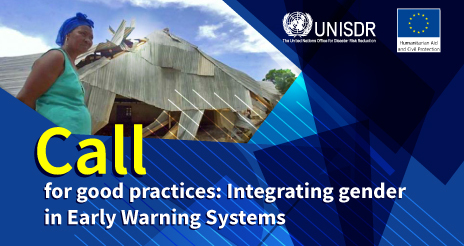 The UN Office for Disaster Risk Reduction (UNISDR) today welcomed the creation of a Multi-Hazard Early Warning Systems Checklist as a major contribution to saving lives in an age of increasing exposure to extreme weather events exacerbated by climate change. 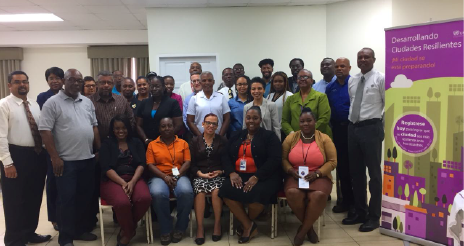 With the objective of formulating the Local Action Plan for Disaster Risk Reduction (DRR) of the city of Port of Spain and applying the self-assessment tool for local resilience (Scorecard, Preliminary Level), a participatory workshop took place in Port of Spain, Trinidad and Tobago this past 14th and 15th of March. This month sees the beginning of a major effort by all UN member States to systematically collect data on everyday losses experienced as a result of natural or man-made hazards as well as related environmental, technological and biological hazards and risks. 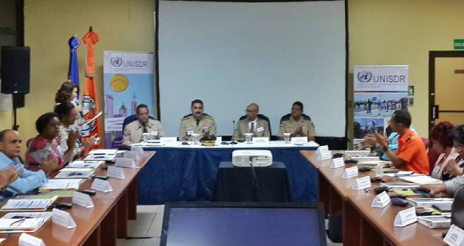 With the objective of identifying actions that support the implementation of the Sendai Framework for Disaster Risk Reduction 2015-2030 and its four priority for actions in the Greater Caribbean, the "From Vulnerability to Resilience Meeting - Exchange of DRR Experiences in the Greater Caribbean Region" was held in Managua, Nicaragua this past 7th and 8th of March. 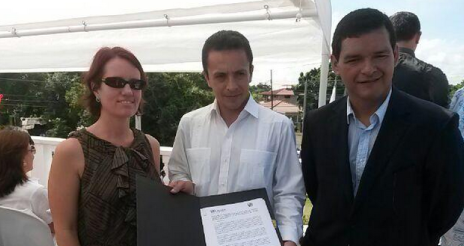 During the meeting, the Declaration of Managua was signed committing to advance the DRR agenda in the Great Caribbean. Marking International Women's Day on March 8, UN Special Representative for Disaster Risk Reduction, Ms. Mami Mizutori made an appeal today for UN Member States to provide better data on the impacts of disasters on women and girls. 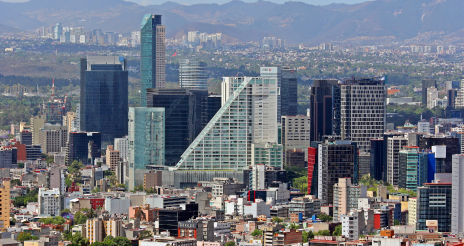 This past January, UNISDR facilitated a three-day City-to-City exchange between Los Angeles and Mexico City, bringing together the 100 Resilient Cities chief resilience officers (CROs) from both cities, a type of collaboration encouraged by the Sendai Framework for Disaster Risk Reduction 2015-2030 to increase the "understanding of disaster risk" at a global level. Disaster risk reduction partners are now considering a proposal to establish a new UNISDR Stakeholder Advisory Group and whole-of-society engagement strategy to support implementation of the global plan to reduce disaster losses, the Sendai Framework for Disaster Risk Reduction in coherence with the Paris Agreement on climate change and Sustainable Development Goals. 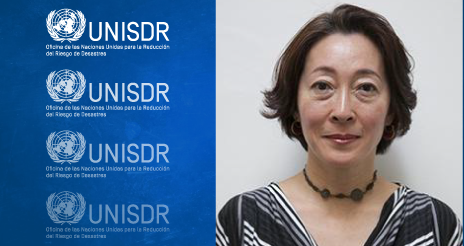 The UN Secretary-General, António Guterres, has announced the appointment of Mami Mizutori of Japan as Assistant Secretary-General and Special Representative of the Secretary-General for Disaster Risk Reduction. Mr. Guterres expressed his appreciation of the dedication and excellent leadership provided to the UN Office for Disaster Risk Reduction (UNISDR) by Robert Glasser of Australia, during his two-year mandate which concludes at the end of this month. 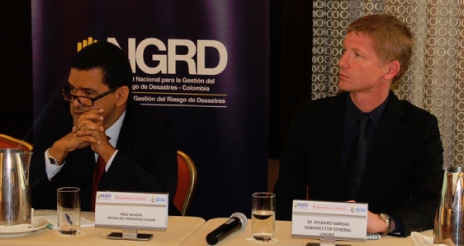 The overall purpose of the Call for good practices of the private sector in DRR is to promote and exchange experiences on how the private sector is engaged in DRR in the Americas. The good practices can be related to how the private sector contributes to the implementation of DRR, how the private sector is making its business and community resilient, and how the private sector and the public sector work together on DRR. 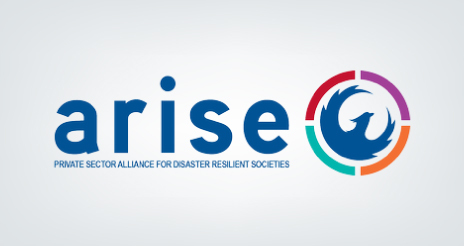 The United Nations Office for Disaster Risk Reduction (UNISDR) launches today the Call for Good Practices for Private Sector in Disaster Risk Reduction with the objective to promote and exchange experiences on how the private sector is engaged in DRR in the Americas. 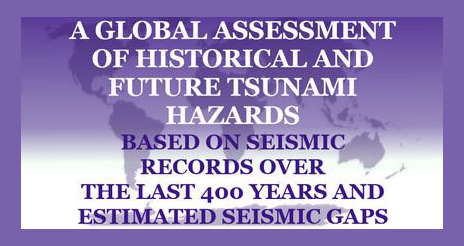 A review of tsunami hazards over the last 400 years highlights "seismic gaps" or locations in the Pacific region where there may be complacency about the tsunami threat following long periods of seismic inactivity. The build up to World Tsunami Awareness Day on November 5 started in earnest today with a high-level gathering of tsunami-affected countries discussing how to reduce tsunami risk "In Japan we say be prepared and have no regrets," said Mr. M. Teru Fukui, Member of Japan's House of Representatives during the panel discussion today on 'Reducing the number of disaster affected people' at the Palais des Nations in Geneva. 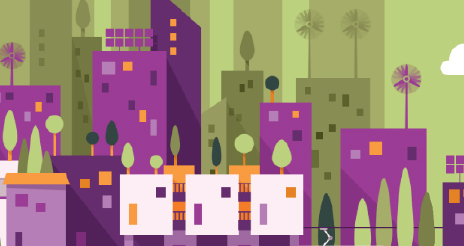 Casa Branca becomes the 1,000th city in Brazil to form part of the "Making Cities Resilient Campaign: My City is Getting Ready! 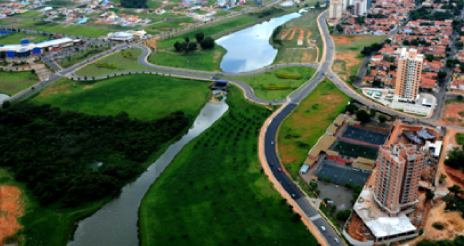 The city of Casa Branca, located in the state of Sao Paulo, Brazil is the thousandth Brazilian city to participate in the "Making Cities Resilient Campaign: My City is Getting Ready!" 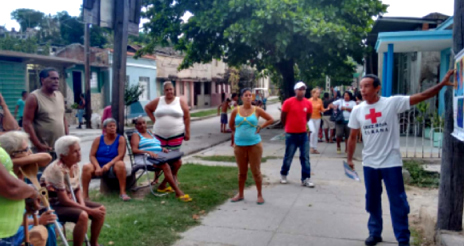 The 30,000 inhabitants of this city have now joined the inhabitants of 999 other Brazilian cities that are part of this global initiative promoted by the United Nations Office for Disaster Risk Reduction (UNISDR). 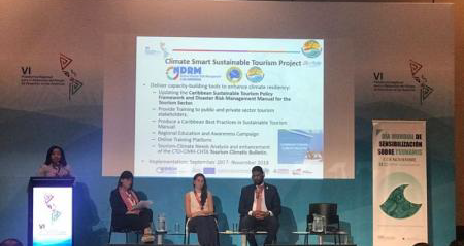 The purpose of the campaign is to increase the political commitment of local governments to disaster risk reduction and adaptation to climate change. 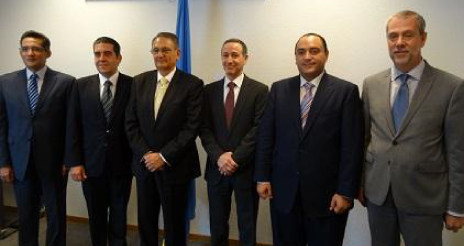 Last Friday, October 20th, ParlAmericas and the United Nations Office for Disaster Risk Reduction (UNISDR) signed a Letter of Cooperation as the first step in a joint work plan to update and promote a parliamentary protocol centered in the Sendai Framework for Disaster Risk Reduction to guide national parliaments in updating legislation related to disaster risk reduction and climate change adaptation. 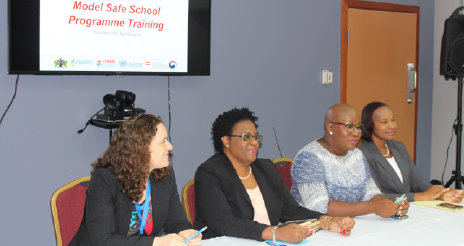 Saint Kitts and Nevis completed the first in a series of trainings being conducted in the Caribbean as part of the Model Safe School Programme (MSSP). 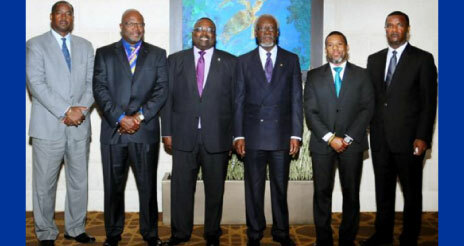 The St. Kitts sessions took place from 9th – 13th of October. This training aims to conduct school vulnerability assessments with the objective of identifying priorities that will strengthen schools safety. 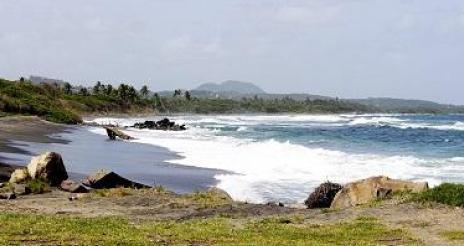 While according to the Caribbean Tourism Organization Saint Kitts and Nevis were spared the worst from Atlantic Hurricanes Irma and Maria; they experiences of this past hurricane season in surrounding islands brought attention to the importance and urgency of implementing school safety within disaster risk reduction policies given its impact on economic and sustainable development at a national and regional level. 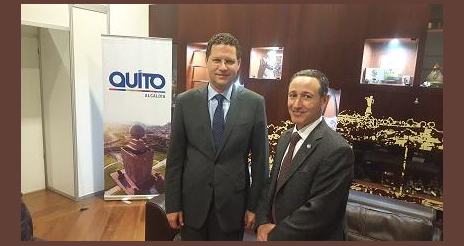 The International Meeting 'Quito: One year after Habitat III' hosted the launch of the Metropolitan Disaster Risk Reduction Management Plan of Quito, called 'Quito Listo' ['Quito is Ready'] prepared by the General Secretariat for Security and Governance of Quito with the support of the United Nations Office for Disaster Risk Reduction (UNISDR). 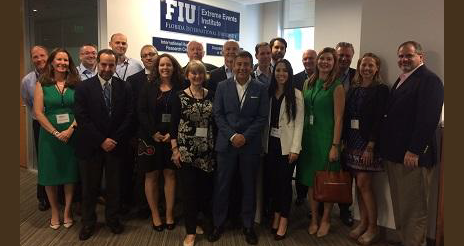 Private sector representatives from key American companies met yesterday in Miami, Florida, to start a US network of a UN-backed global initiative to create greater understanding of disaster risk in the business community, to safeguard future investments and reduce economic losses from disasters. 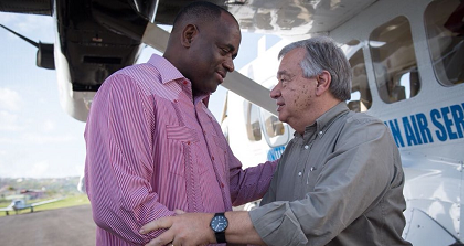 Following the devastation wrought on his Caribbean island home by Hurricane Maria, the Prime Minister of Dominica, Mr. Roosevelt Skerrit, is calling on the world not “to turn its back” on the problem of climate change and for greater investment in disaster risk reduction. The devastation to public facilities and schools in the region during this Hurricane season has raised awareness on the need to accomplish school safety as integral part of disaster risk reduction policies at regional and national level. 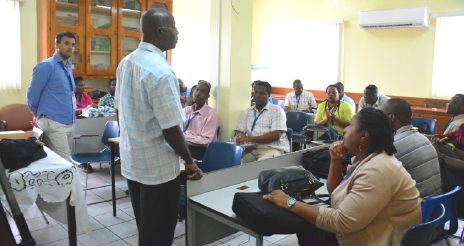 In order to enhance school safety, representatives from Ministry of Education, Innovation, Gender Relations and Sustainable Development, the Ministry of Infrastructure, the National Disaster Management Office (NEMO) as well as Principles and Teachers from different schools in Saint Lucia attend a workshop training from 3 to 6 October in Castries to learn how to apply the Model Safe School Programme (MSSP). The Municipality of Gral. 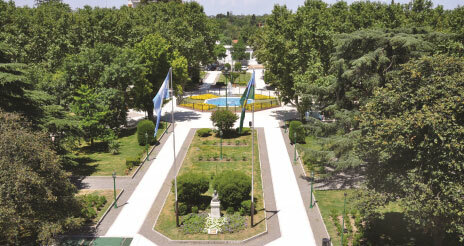 San Martín, with a surface of 56km², is one of the seven municipalities that makes up the first crown that surrounds the Autonomous City of Buenos Aires, historically the Capital of the Argentine Republic. 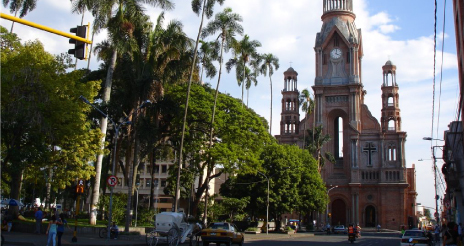 The Municipality of General San Martín has a population of 414,196 inhabitants, with a density of 7,396 hab / km2. It presents a balanced population pyramid, high population density, an industrial sector with marked hegemony between the different economic productive sectors of the municipality, and an important level of urban consolidation, with contrasts marked by large sectors of popular urbanization on the margin of the Reconquista river. 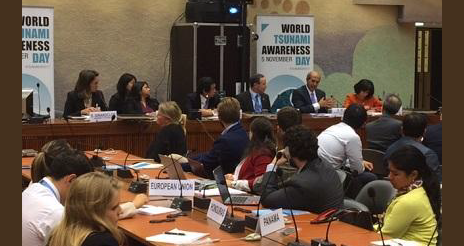 In recognition of the ability of youth to impact policies and issues that affect their communities, the United Nations Office for Disaster Risk Reduction (UNISDR), through its Regional Office for the Americas, invites young people to raise awareness towards tsunamis risk by participating in the first "Youth Wave of Awareness". 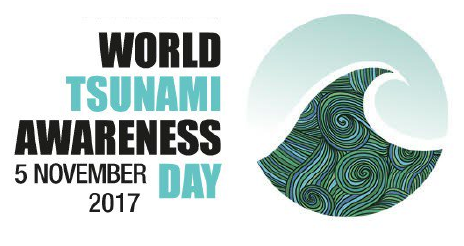 This initiative is carried out within the framework of this year’s World Tsunami Awareness Day, to be celebrated in November 5th, 2017. Petrópolis is located at the top of Serra da Estrela, in Serra dos Órgãos, in the Serrana Region of the State of Rio de Janeiro, 68 km from the city of Rio de Janeiro, Brazil, and has a population of 305,917 inhabitants (2010). According to the climate classification of Köppen, it has a tropical climate of altitude (Cwb) with mild and rainy summers that potentiate landslides, floods and rocky block bearings, and dry winters that increase drought and devastating forest fires in its large preserved green areas. 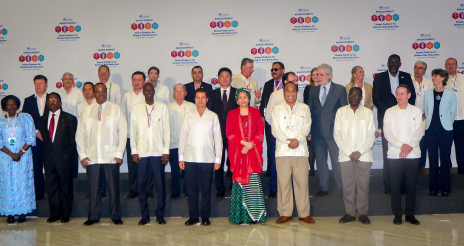 The President of Mexico, Enrique Peña Nieto, and the UN Deputy Secretary-General, Ms. Amina Mohammed, today met with other world leaders and heads of international organizations to identify practical measures for reducing economic losses. 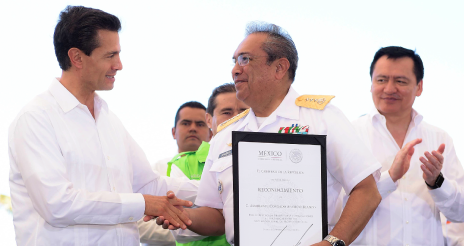 The Global Platform for Disaster Risk Reduction was inaugurated today by the President of Mexico, Enrique Peña Nieto, as some 6,000 participants descended on the coastal town of Cancun for a series of working meetings to make progress on reducing disaster losses. A UN-backed group of companies working to curb hazard impacts has unveiled a new plan of action on the eve of the 2017 Global Platform for Disaster Risk Reduction. 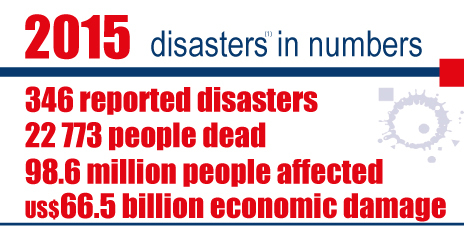 The escalation of economic losses from disasters is expected to draw a record attendance of 7,000 people at a biennial UN forum that will bring world leaders and representatives of civil society together to agree ways and means of preventing and mitigating disaster impacts. Dozens of the world's most climate-vulnerable island nations today spotlighted efforts to curb threats posed by hazards and to make development sustainable, ahead of the 2017 Global Platform for Disaster Risk Reduction. 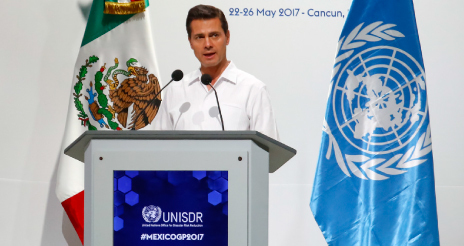 The United Mexican States, through its Ministry of the Interior, and the United Nations, through its United Nations Office for Disaster Risk Reduction (UNISDR), signed a Collaboration Agreement in the framework of the 2017 Global Platform for Disaster Risk Reduction, to be held in Cancún, Quintana Roo; this upcoming May 22nd - 26th. The International Mother Earth Day promotes education and action by empowering everyone with knowledge to inspire action in defense of environmental protection. 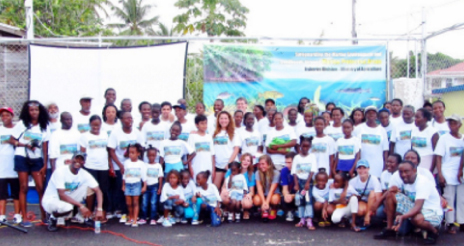 This year's International Mother Earth Day highlights "Environmental & Climate Literacy". 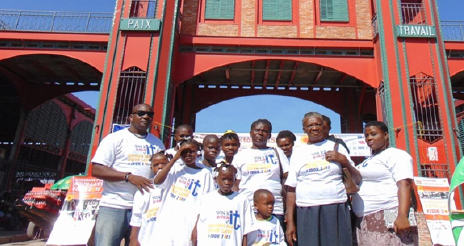 In this context, initiatives for disaster risk reduction (DRR) in the Caribbean such as the Caribbean "Road Show", the "Drought Petit Committee" in Dominican Republic and the "At the Water's Edge" (AWE) pilot project in Grenada, were developed and implemented within the framework of the Comprehensive Disaster Management Strategy for the Caribbean 2014-2024 (CDM) and the Sendai Framework for Disaster Risk Reduction 2015-2030. The aim of these initiatives has been to emphasize the importance of climate change awareness and action as key elements for resilience building. 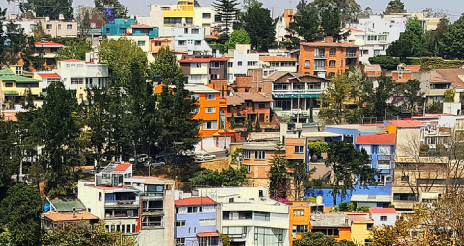 Five years after the devastating 1985 quake, which killed more than 10,000 people, Mexico equipped itself with one of the world's most effective early warning systems for earthquakes. 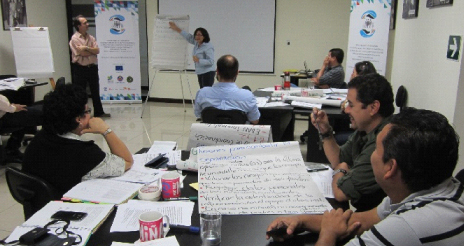 In order to safeguard means of production, ensure the continuity of operations and reduce the risk of human and material losses from natural hazards, Guatemalan business groups met for the first time to design business plans for disaster risk reduction within the framework of the "Public Private Partnerships to Confront Disaster Risk in Guatemala" project, funded by The European Commission Directorate-General Humanitarian Aid &Civil Protection (ECHO). 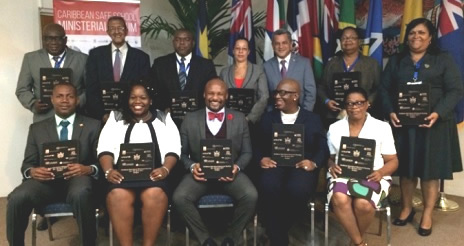 Ministers and other high-level authorities from the Education sector endorsed the Antigua and Barbuda Declaration for School Safety during the Caribbean Safe School Ministerial Forum which took place from 3 to 4 April 2017 and was hosted by Antigua and Barbuda's Ministry of Education, Science and Technology. Hon. 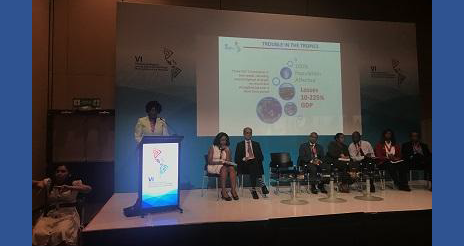 Michael S. Browne, Minister of Education, Science & Technology, Antigua and Barbuda, highlighted that "In the Caribbean, there is the need to have clarity on how everyone, individuals, nations and the region will respond to disasters, for which there is the need to work as a team". 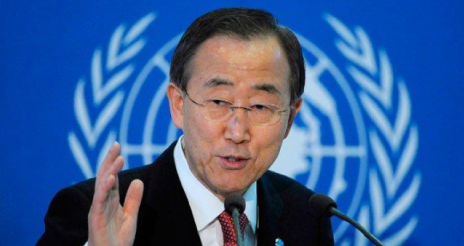 As the reported death toll from Saturday's mudslide disaster rose to 273, the UN Secretary-General's Special Representative for Disaster Risk Reduction, Mr. Robert Glasser, extended his condolences to the people of Colombia and the affected communities of Mocoa on the loss of life caused by the heavy rains and mudslides exacerbated by deforestation. 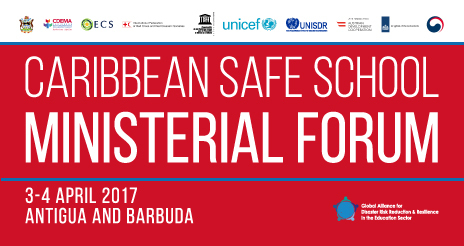 The adoption of the Caribbean Declaration and Road Map on School Safety is expected during the first Caribbean Safe School Ministerial Forum to be hosted by the Ministry of Education, Science and Technology of Antigua and Barbuda from 3 to 4 April, 2017. This high-level event aims to promote and raise public awareness on the three pillars of School Safety of the Comprehensive School Safety (CSS) Framework, which guides the Worldwide Initiative for Safe Schools (WISS). 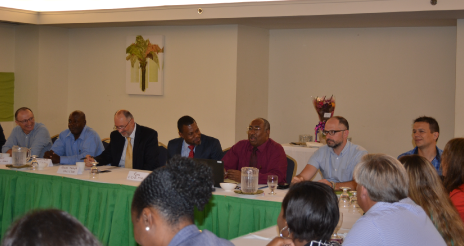 The Forum will identify national and joint regional achievements and priorities for School Safety in the Caribbean. 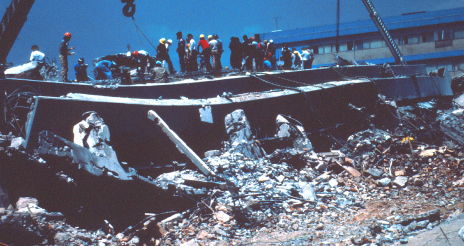 Mexico City's devastating, 8.1-magnitude earthquake of 1985 was a stark illustration of the disaster risks faced by the health sector, but it also triggered what became a global effort to protect hospitals from hazards. After a tremor of 70 seconds, quake damage had reduced Mexico's hospital capacity by 5,000 beds, sowing chaos in the emergency system at the precise moment that it was most need. 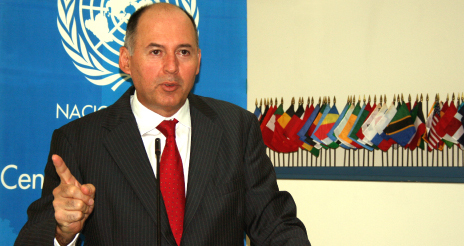 The United Nations Special Representative of the Secretary-General for Disaster Risk Reduction, Mr. Robert Glasser, today extended his condolences to the people of Peru on the loss of life caused by the on-going deadly rains, floods and landslides which have led to the declaration of a state of emergency. Mr. Glasser said: "Few countries were better prepared for the recent global El Niño than Peru so it is doubly concerning that the country has been overwhelmed by this occurrence of local El Niño-like conditions which have flipped the country from widespread drought to enormous flooding that has taken dozens of lives, affected over half a million people and left many homeless. Two years have passed quickly since the adoption of the Sendai Framework for Disaster Risk Reduction kicked off one of the most ambitious projects in the history of the United Nations: the all-encompassing 2030 Agenda for Sustainable Development. The Fifth Regional Platform for Disaster Risk Reduction in the Americas (RP17) brought together delegates from across the Americas to discuss efforts to reduce disaster risks posed by natural and human-induced hazards and to approve a Regional Action Plan (RAP) to meet the United Nations (UN) Sendai Framework for Disaster Risk Reduction (DRR) 2015-2030 commitments. Baillie the Border Collie stands motionless, eyeballing her handler, then springs into action when he gives the command: "Find it!" 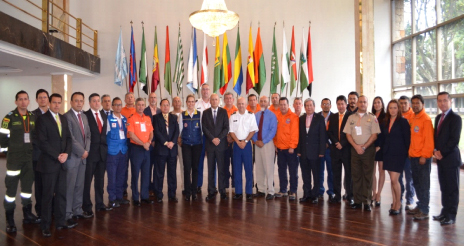 The four-year-old is part of the Canada Task Force 2 Disaster Response Team, among the thousand delegates at the 5th Regional Platform for Disaster Risk Reduction in the Americas. 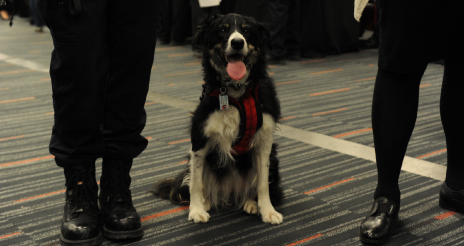 She is one of an elite of 20 "Heavy Urban Search and Rescue" dogs spread across Canada, whose tasks include combing through rubble for trapped people. 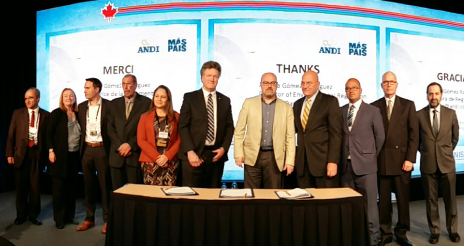 Canadian businesses have joined a UN-backed drive to bolster resilience to natural and human-induced hazards, sending a strong signal during the Americas region's top disaster risk reduction conference. "There is a clear mutual interest for the public and private sectors to work together, as the private sector relies on the resilience of public infrastructure and services to conduct their businesses, and governments and communities depend on resilient business practices for a stable and sustainable economy," said Mr. David Greenall, Director of Sustainable Business Solutions at PricewaterhouseCoopers, one of the initiators of the creation of the Canada chapter of the UNISDR Private Sector Alliance for Disaster Resilient Societies, known for short as ARISE. 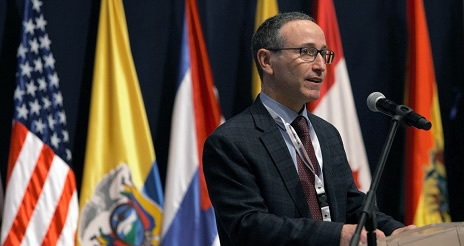 The vast Americas region today started a high-level conference on a wide-ranging plan that will seek to reduce the risks posed by natural and human-induced hazards. 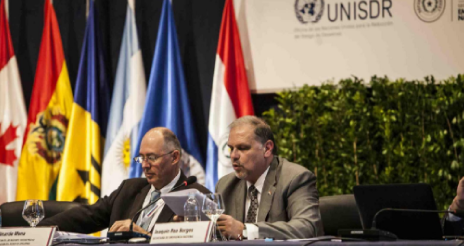 The three-day 5th Regional Platform for Disaster Risk Reduction in the Americas has drawn a thousand delegates from over 50 countries and territories to Montreal. In his opening speech, said Mr. Robert Glasser, Special Representative of the UN Secretary-General for Disaster Risk Reduction, said he expected the conference to "help bring us closer to a disaster-resilient future where the focus is on reducing existing levels of risk and avoiding the creation of new risk. " 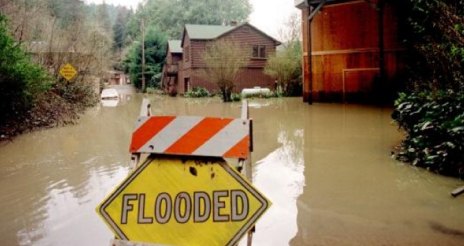 Governments from across the Americas are gathering this week in Canada for a high-level conference where they aim to make their vast region more resilient by adopting a plan to curb the risks posed by natural and human-induced hazards. 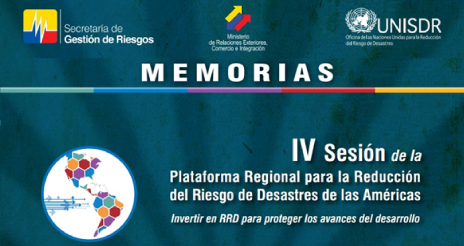 The 5th Regional Platform for Disaster Risk Reduction in the Americas (RP17), running from Tuesday to Thursday in Montreal, is set to draw delegates from 33 countries following a year in which the region continued to feel the consequences of a strong El Niño and over a thousand lives were lost in the Ecuador earthquake and the onslaught of Hurricane Matthew. 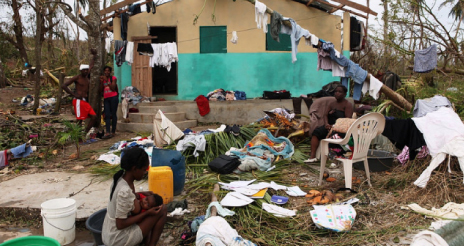 There was a call today for urgent support to improve disaster risk management in Haiti following a damning investigation of the country's losses from Hurricane Matthew six months ago. The UN Secretary-General's Special Representative for Disaster Risk Reduction, Mr. Robert Glasser said: "Hurricane Matthew revealed disturbing truths about least developed countries which lack the capacity to respond adequately to climate change and the rising intensity and frequency of weather-related disasters. 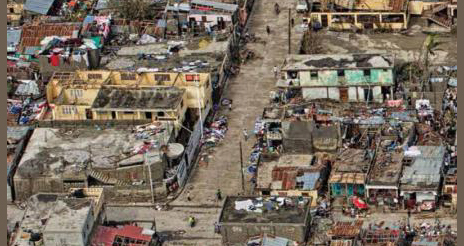 The Americas region meets next week to discuss the best way forward to reduce disaster losses as a new Post Disaster Needs Assessment (PDNA) demonstrates the full impact of the devastation wrought on Haiti by Hurricane Matthew in October last year. 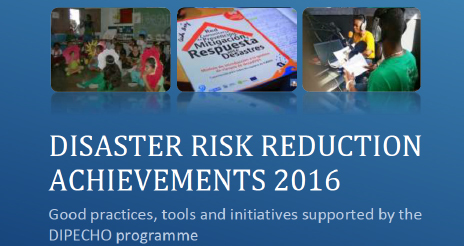 The Disaster Risk Reduction Achievements 2016, a new publication compiling 50 good practices, tools and initiatives supported under the framework of the 2015-2016 DIPECHO Action Plan was recently launched with the purpose of contributing to the implementation of the Comprehensive Disaster Management (CDM) Strategy 2014-2024 and the Sendai Framework for Disaster Risk Reduction 2015-2030. 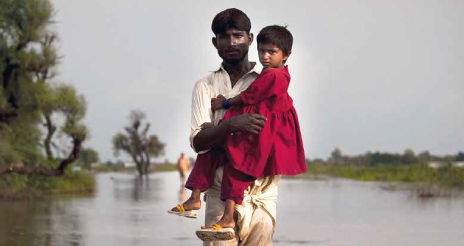 All initiatives in the publication are associated to one of four thematic focus areas: Early Warning Systems, Communicating Disaster Risk Reduction (DRR), Information & Knowledge Management and Institutionalization of DRR. 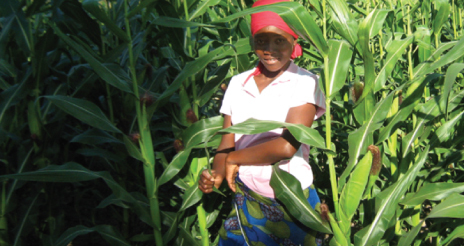 The publication facilitates DRR information sharing which enables amongst others joint planning and programming. 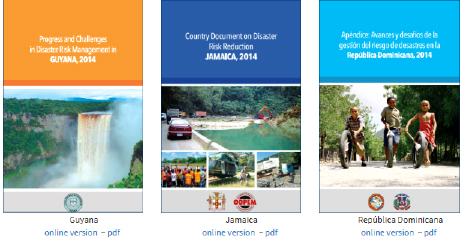 The Country Documents for Disaster Risk Reduction (DRR) for Barbados, Dominica, Dominican Republic, Grenada, Guyana, Jamaica, Saint Lucia, Saint Vincent and the Grenadines, and Trinidad & Tobago are now available online. The Country Document is an essential tool that provides a comprehensive overview of DRR in a country and the online version will now facilitate access to DRR relevant information and allow countries to update the content of the document in real time. 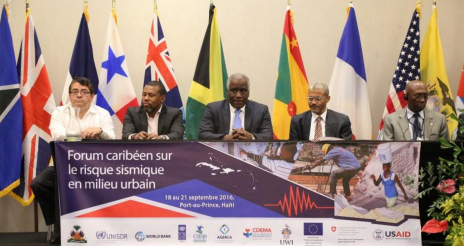 After setting national and regional disaster risk reduction (DRR) priorities for the Caribbean, Ministers from this sub-region will meet in Montreal to discuss with their counterparts in the Americas the priorities on this thematic area, for the upcoming years. The photo titled "Earthquake Drill" by Carlos Roberto Márquez Ramos was chosen as the winner of the Call for Disaster Risk Reduction Tools, Good Practices and Photos 2016 "Photo Contest", promoted By the United Nations Office for Disaster Risk Reduction (UNISDR), through its Regional Office for the Americas. Jose Emilio Morales, of Chile, Winner of the Video Challenge "Youth and Disaster Risk Reduction"
The United Nations Office for Disaster Risk Reduction (UNISDR), through its Regional Office for the Americas, is pleased to report that Jose Emilio Morales, producer and protagonist of the video "Disaster Risk Reduction Chile," has been selected as winner of the "Youth and Disaster Risk Reduction" Video-Challenge carried out at the continental level between 3 January 3 and 15 February, 2017.
he United Nations General Assembly today adopted a resolution containing indicators for measuring global progress in reducing disaster losses. The same resolution also includes a comprehensive A to Z overhaul of terminology related to disaster risk reduction to guide policymakers and decision-makers working on strategic plans for disaster risk management. Today January 12, 2017 marks the 6th anniversary of the magnitude 7.0 earthquake that devastated Haiti. 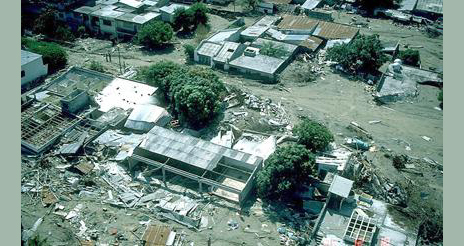 The earthquake affected over 3 million people and claimed up to 150,000 lives. 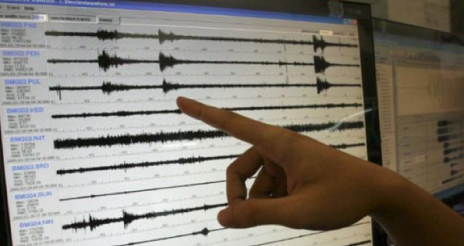 Earthquakes rank among the highest in potential to cause the most destruction in one event in the Caribbean. Many countries within the Caribbean Region are threatened by future large earthquakes which will occur when strain accumulation on segments of the adjacent tectonic plate boundary exceeds breaking point. 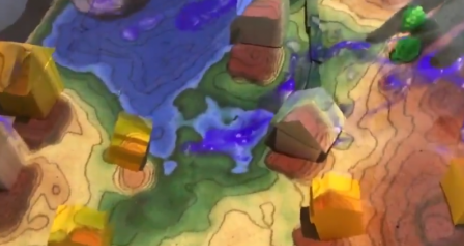 To a large extent, the resulting damage will depend on the choice of risk management measures that are implemented to evade or reduce vulnerability to strong ground shaking. 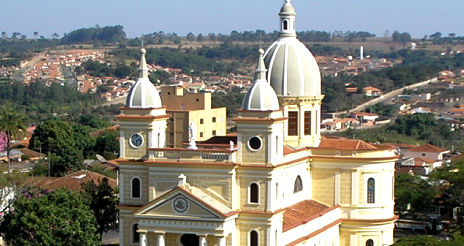 The Canton of El Empalme is located in the Province of Guayas in the Republic of Ecuador. It has a territorial extension of 648.90 km2 and a population of more than 81,000 inhabitants. 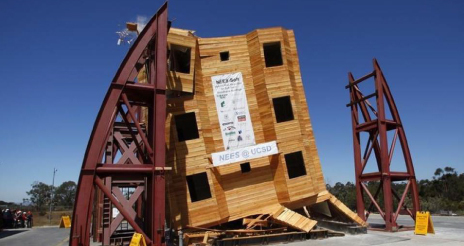 It is exposed to natural phenomena such as drought, earthquake, flood, landslides and forest fires. 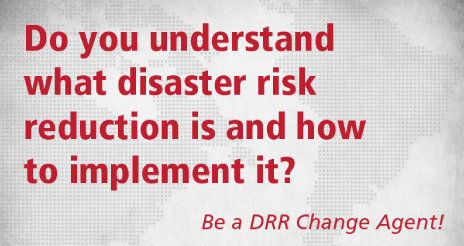 ANNOUNCEMENT: Video-Challenge of youth for DRR! Do you want to travel to Canada to get your ideas on disaster risk reduction heard? Then this opportunity is for you! In recognition of the ability of the youth to offer new perspectives on the discussion of policies that have an impact on their communities and countries, the United Nations Office for Disaster Risk Reduction (UNISDR), through its Regional Office for Disaster Reduction – The Americas, invites young people in the Americas interested in contributing to the sustainable development of their communities, to participate in the first "Youth Video Challenge for Disaster Risk Reduction (DRR)" to be carried out within the framework of the Regional Platform For Disaster Risk Reduction in the Americas (PR17), to be held in Montreal, Canada, from 7 to 9 March 2017. On his first day at the helm of the United Nations, Secretary-General António Guterres today pledged to make 2017 a year for peace. 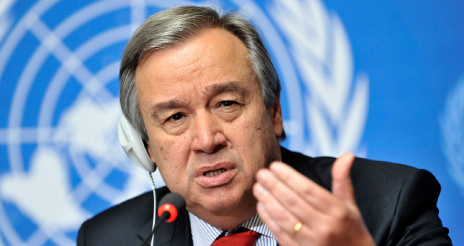 "On this New Year's Day, I ask all of you to join me in making one shared New Year's resolution: Let us resolve to put peace first," said Mr. Guterres in an appeal for peace. Thirty-five professionals in disaster risk management from 16 countries of the Americas successfully completed their training in structuring disaster risk reduction plans within the framework of the international programme promoted by the Global Education and Training Institute (GETI), the United Nations Office for Disaster Risk Reduction (UNISDR) training body. 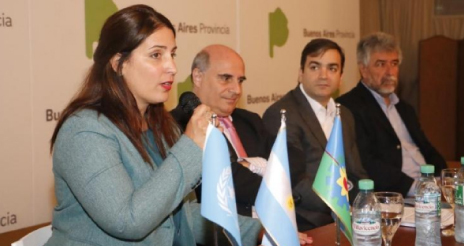 The Crisis Management and Organizational Resilience Service (SeCRO), an initiative promoted by Fundación Telefónica, Transbank, Aguas Andinas and five other leading companies in responsibility and sustainability, is the new Focal Point in Chile for the Private Sector Partnership for Disaster Resilient Societies (ARISE). 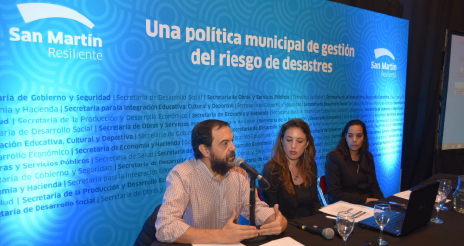 In order to address disaster risk management as a development policy by strengthening resilience at the local level and in line with the Sendai Framework, the government of the province of Buenos Aires, Argentina joined the 3,461 cities around the world participating in the Global Campaign "Making Cities Resilient: My City is Getting Ready!" 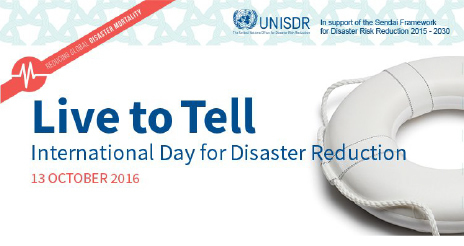 promoted by the United Nations Office for Disaster Risk Reduction (UNISDR) since 2010. 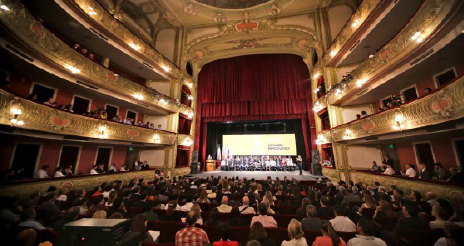 With the objective of guiding the development process in the region towards 2030, the "Building Resilient Cities within the Framework of Regional Integration" Declaration - also known as the Santa Fe Declaration - was adopted unanimously at the XXI Summit of Mercocities held in the city of Santa Fe, Argentina. 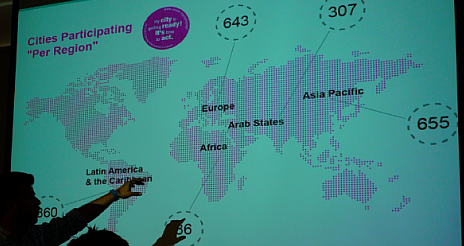 UNISDR, in the framework of the Global "Making Cities Resilient Campaign: My city is getting ready!" Calls present proposals for the City-to-City learning exchange of 2016-2017. This initiative seeks to integrate the lessons learned and the experience gained from exchanges between governments of the different regions, carried out within the framework of disaster risk reduction. 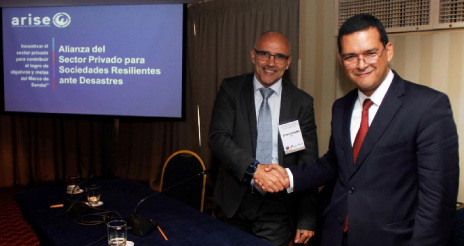 In order to contribute substantially to the sustainable development of the country, through the active participation of the private sector in collaboration with the public sector and other actors, Peru's National Chapter of the Private Sector Alliance for Disaster Resilient Societies (ARISE) was created to consolidate a society resilient to disaster. The UN Office for Disaster Risk Reduction (UNISDR) has called on governments, businesses and communities in island nations to work together to curb the impact of hazards stoked by climate change. 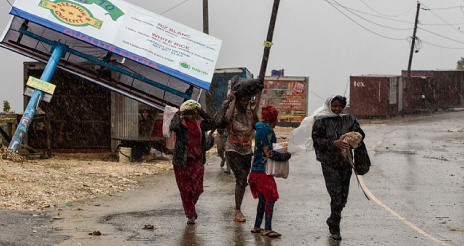 "Small Island Developing States are disproportionally affected by disasters. 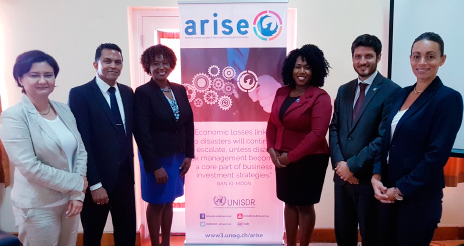 The expected higher economic losses from future disasters will heavily impact on budgets and investments of both the government and the private sector," UNISDR representative Mr. Neil McFarlane told a conference at the University of West Indies' Mona School of Business and Management. Latin America and the Caribbean, a region where 34.3 million people still suffer from hunger, now has the basic guidelines and recommendations for the integration of disaster risk management and adaptation to climate change in the planning and implementation of actions for the sustainable development of the agricultural and food and nutritional security sector, through the implementation of the Sendai Framework for Disaster Risk Reduction 2015-2030 in this sector. 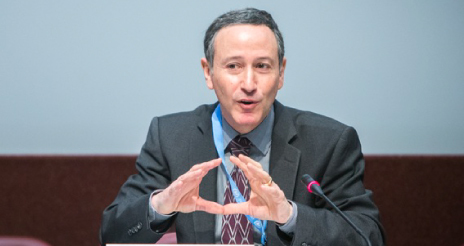 The UN Secretary General's Special Representative for Disaster Risk Reduction, Robert Glasser, has welcomed the adoption of the Habitat III New Urban Agenda as "a significant contribution to focussing attention on the risks of rapid urbanisation and the importance of taking concrete measures to build cities in a way that reduces exposure to disasters and improves the quality of life for urban dwellers." 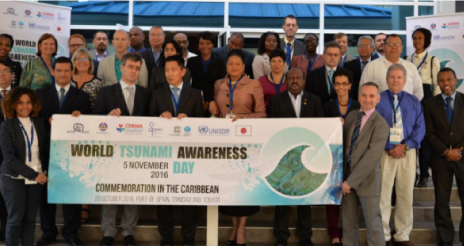 The commemoration of the World Tsunami Awareness Day in the Caribbean will take place on 20 October 2016 in Trinidad and Tobago, back-to-back to the Special Committee Meeting of the Disaster Risk Reduction of the Association of Caribbean States (ACS). A high level panel has called for innovative approaches to increase financing so that cities become resilient to natural and man-made hazards and other shocks. The UN Secretary-General's Special Representative for Disaster Risk Reduction, Mr. Robert Glasser, today marked International Day for Disaster Reduction by recognising five outstanding examples of successful efforts to reduce disaster mortality. #IDDR2016: Ban Ki-moon says new disaster mortality report a "damning indictment of inequality"
Analysis of twenty years of data on 7,056 disaster events in which 1.35 million people died, shows that earthquakes and tsunamis are the biggest killers overall, followed closely by climate-related disasters, and 90% of disaster deaths occur in low and middle-income countries. 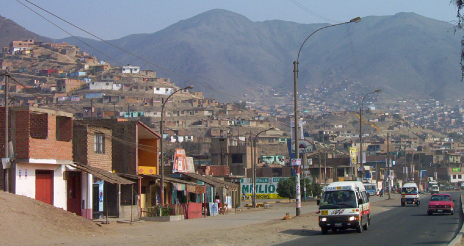 The implementation of the El Niño Contingency Plan 2015, coupled with the moderate intensity of the phenomenon - which occurred approximately between February 2015 and May 2016 and registered at least 20 deaths and about 8,700 victims – represented a significant reduction of human and economic losses in Peru as compared to the "Meganiños" of 1982/83 and 1997/98, which killed more than 9,300 people and resulted in estimated losses equivalent to 11.6% and 6.2%, respectively, of annual GDP. Governments at the UN Summit on Refugees and Migrants have adopted a landmark declaration that underlines the role of environmental degradation, climate change and disasters alongside conflict as drivers of the ongoing crisis. The "New York Declaration" contains ambitious commitments to find durable solutions and coordinated approaches, to address root causes and to provide a more humane and managed response to the plight of refugees and migrants. 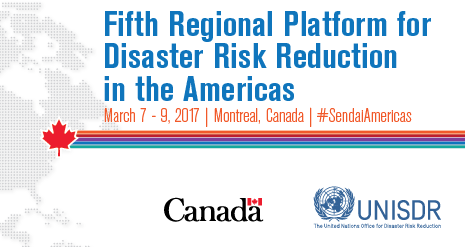 SAVE THE DATE REGIONAL PLATFORM FOR DISASTER RISK REDUCTION IN THE AMERICAS FIFTH SESSION, MONTREAL, CANADA 7 - 9 MARCH 2017. 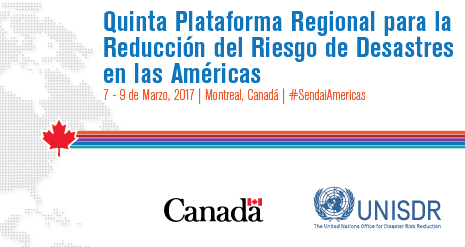 We are pleased to inform you that the Fifth Regional Platform for Disaster Risk Reduction (DRR) in the Americas (#SendaiAmericas) will take place in Montreal, Quebec, Canada from 7 - 9 March 2017. 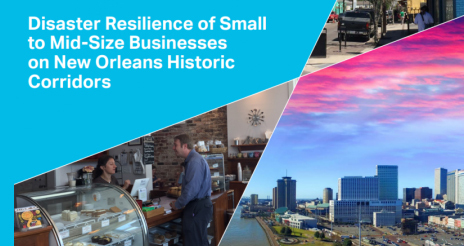 New Orleans, the epicentre of Hurricane Katrina, is engaging with its private sector to improve disaster risk awareness as part of its overall strategy for improving resilience to disasters and facilitating rapid recovery after an event. 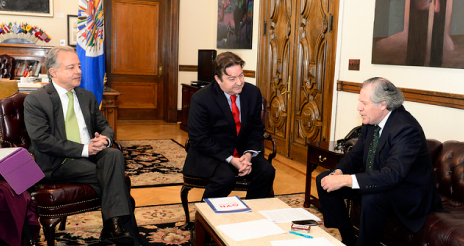 In order to institutionally incorporate the topic of disaster risk reduction in all its ministries, departments, agencies and offices, the Organization of American States (OAS) adopted the "Institutional Management Policy Disaster Risk" in line with the Sendai Framework for Disaster Risk Reduction 2015-2030 which reinforces OAS commitment to strengthening resilience as a key element in their development agenda of 2030. 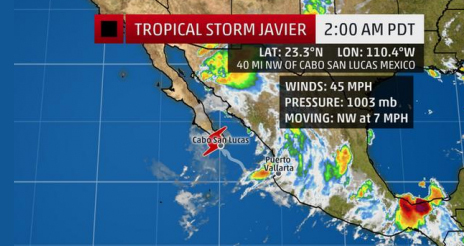 The Civil Protection Authorities have warned of the possibility of further landslides as the country braces itself for the passage of Tropical Storm Javier on the Pacific coast while search efforts are continuing for survivors of weekend mudslides which claimed 40 lives inclusing those of 23 children. 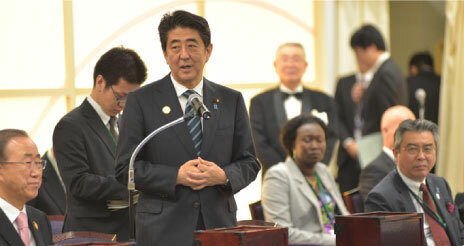 The UN Secretary-General's Special Representative for Disaster Risk Reduction, Mr. Robert Glasser, today launched "The Sendai Seven Campaign – 7 Targets, 7 Years", an advocacy initiative to encourage implementation of the Sendai Framework for Disaster Risk Reduction with the goal of saving lives, reducing disaster losses and improving management of disaster risk. 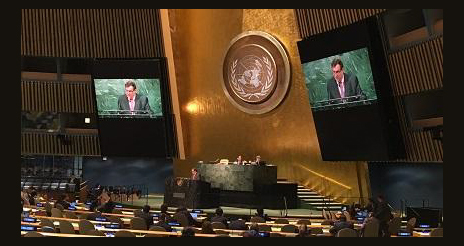 The UN Secretary-General’s Special Representative for Disaster Risk Reduction, Mr. Robert Glasser, today hailed as “a major breakthrough” the announcement by Prime Minister, Justin Trudeau, Canada, President Barack Obama, USA; and President Enrique Peña Nieto, Mexico, that they will take sweeping action to achieve 50% clean power generation by 2025 and cooperate on reducing disaster risk. 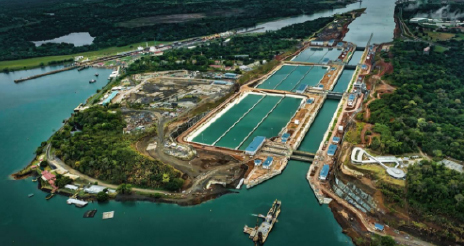 In the midst of one of the worst droughts in decades, the expansion of the Panama Canal starts its operation as an example of sustainability and efficiency in water use. The new labor is imposed as a model of adaptation to climate change and disaster risk reduction, thanks to their water system that will allow an efficient response to climatic and geological risks that have affected the Canal in previous years..
Canada's Minister of Public Safety and Emergency Preparedness, the Honorable Ralph Goodale, announced that Canada in collaboration with the United Nations Office for Disaster Risk Reduction (UNISDR) will host the Fifth Regional Platform for Disaster Risk Reduction of the Americas in 2017. 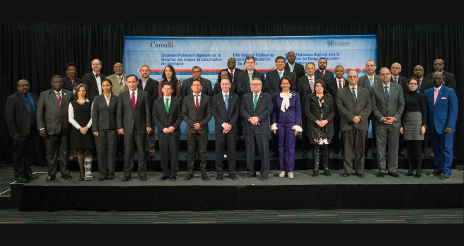 Ministers and High Level Authorities of Member States of the United Nations in the Americas, today adopted the "Declaration of Asuncion" containing the priority agenda and guidelines of a Regional Action Plan for the implementation of the Sendai Framework for Disaster Risk Reduction 2015-30 in the region. 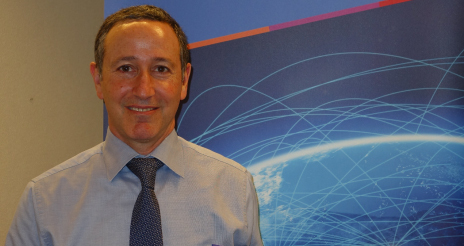 The Americas have reached a new level in their drive to curb disaster risk in one of the most hazard-exposed regions of the world, UNISDR's head Mr. Robert Glasser has told ministerial talks hosted by Paraguay. "I believe this meeting marks the beginning of a new phase in the region's growing sophistication when it comes to strengthening disaster risk governance and ensuring that risk informed decision making becomes part of the daily life of government," Mr. Glasser told participants at the First Meeting of Ministers and High-Level Authorities on the Implementation of the Sendai Framework, which began on Wednesday in the capital Asunción. Agreeing the guidelines for the development of a Regional Action Plan for Disaster Risk Reduction, as a key element to achieve sustainable development in the region, is the goal of the First Meeting of Ministers and High-Level Authorities on the Implementation of the Sendai Framework for Disaster Risk Reduction 2015-2030 in the Americas, to be held on 8 - 9 June 2016 in Asunción, Paraguay. The EU has today released € 4 million in humanitarian aid to the most vulnerable victims of the earthquake which struck Ecuador on 16th April 2016. 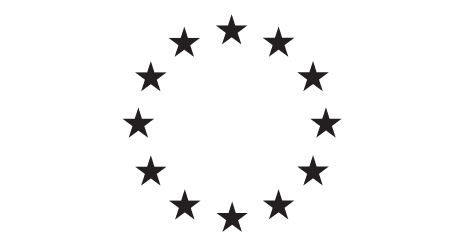 The funding comes on top of an initial € 1 million released only 36 hours after the disaster last month, and the mobilisation of expert teams via the EU Civil Protection Mechanism which which were dispatched to crisis zones. 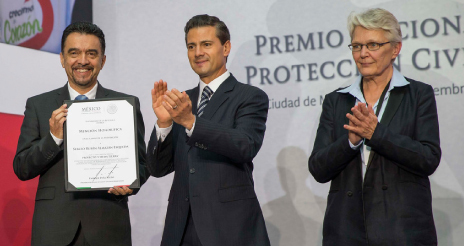 The President of Mexico, Mr. Enrique Peña Nieto, today re-committed his country to implementing the Sendai Framework for Disaster Risk Reduction as he paid tribute to the National System for Civil Protection on the 30th anniversary of its founding. 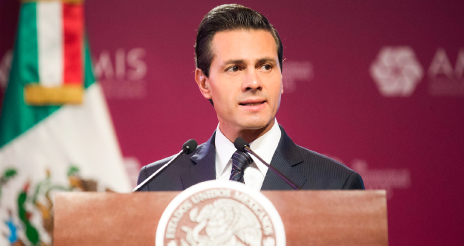 The President outlined his vision for Mexico to become a role model for disaster risk reduction over the next 15 years, the lifetime of the Sendai Framework which is the global plan for reducing disaster losses adopted last year by UN member States meeting in Sendai, Japan. 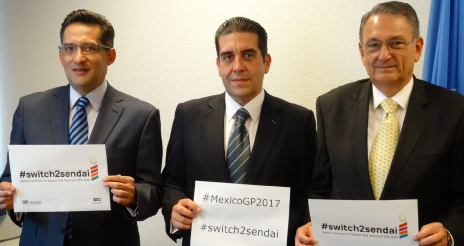 Mexico, as host country, will encourage the 2017 Global Platform on Disaster Risk Reduction to focus on reducing economic losses from disasters, it emerged today. 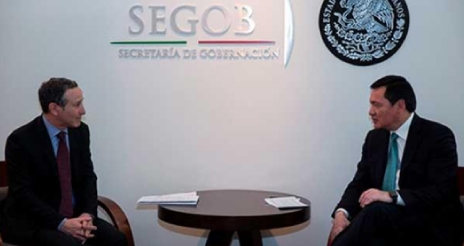 In the context of the 30th anniversary of the National Civil Protection System, the Mexican President Mr. Enrique Peña Nieto, met today with the head of the UN Office for Disaster Risk Reduction and reaffirmed his country's commitment to implementing the Sendai Framework for Disaster Risk Reduction, a global plan to reduce disaster losses adopted last year. 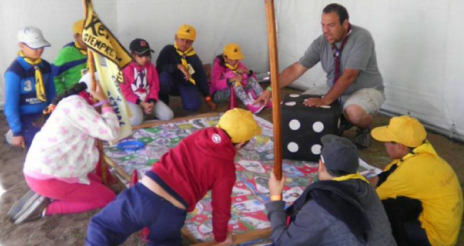 Around 4,000 boys and girls scouts from 7 to 14 years old participated in the "Scout Adventure without Risk" workshop, where they learned with games to address issues related to reducing disaster risk, through an adaptation of "Riesgolandia" by the Civil Association of Scouts of Argentina (SAAC), earlier this year. The institutionalization and harmonization of Early Warning System (EWS) as well as integrating vulnerable groups in all processes related to EWS were the main themes of the Caribbean Early Warning System Workshop that took place last week, in which more than 70 participants from National Disaster Management Agencies, National Meteorological Services, National Red Cross Societies, Non-Governmental Organizations as well as regional, research, intergovernmental and United Nations organizations identified next steps on how to enhance coordination among stakeholders towards the harmonization of multi-hazard EWS in the Caribbean. The head of the UN Office for Disaster Risk Reduction, Mr. Robert Glasser, today extended his condolences to the people of Ecuador and Japan for the loss of life in the earthquakes which have hit both countries in recent days. The Caribbean Disaster Emergency Management Agency (CDEMA) and the United Nations Office for Disaster Risk Reduction (UNISDR) announced the project "Strengthening Regional Disaster Risk Reduction Strategies and Capacities for Resilience in the Caribbean", that is supported by the Austrian Development Agency (ADA), during the Disaster Risk Reduction Development Partners Meeting which took place yesterday in Barbados. 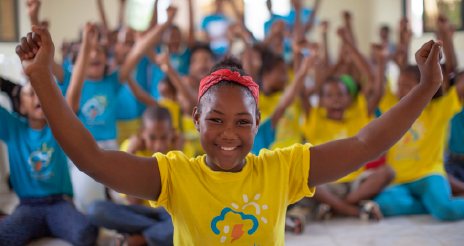 The purpose of the project is reinforcing disaster risk reduction and creating a resilience culture in the Caribbean. Ensuring that companies understand and act on the risks posed by natural and man-made hazards is a vital step towards reducing disaster impacts. Business education offers a tool to achieve this. The National Coordinator of Civil Protection of Mexico, Mr. Luis Felipe Puente, and the head of the UN Office for Disaster Risk Reduction (UNISDR), Mr. Robert Glasser, today announced that Mexico will host the next global conference on how to reduce loss of life and economic losses from disasters caused by man-made and natural hazards, the most important multilateral forum in its kind. 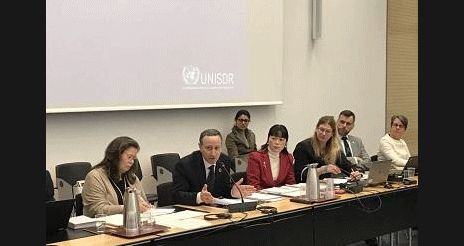 A high-level delegation from Mexico, one of the world's most disaster prone countries, visited the UN Office for Disaster Risk Reduction today and provided a briefing on its implementation of the Sendai Framework for Disaster Risk Reduction which was adopted on March 18, 2015. Just as the worst of the Ebola epidemic in West Africa seemed to be over, the mosquito-borne Zika virus has led to the declaration by WHO of a public health emergency of international concern following a steep rise in congenital malformations and neurological complications among new-born children of infected women. 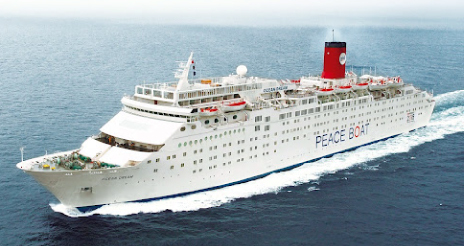 Peace Boat is arriving in Uruguay to promote the “Making Cities Resilient: My City is Getting Ready” Global Campaign that was launched in 2010 by the United Nations Office for Disaster Risk Reduction (UNISDR). This campaign seeks to strengthen political commitment to the reduction of disaster risks as well as adaption to climate change at the local government level, and to promote collaboration amongst various stakeholders to push for implementation of the Sendai Framework at the local level. 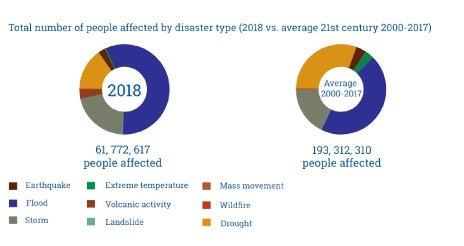 The hottest year on record, 2015, has confirmed that weather and climate-related disasters now dominate disaster trends linked to natural hazards, according to a new analysis presented today. The top five most disaster-hit countries in 2015 were China (26), USA (22), India (19), Philippines (15) and Indonesia (11). The Sendai Framework is relevant to the health sector, as to all sectors which contribute to managing health risks of emergencies and disasters. 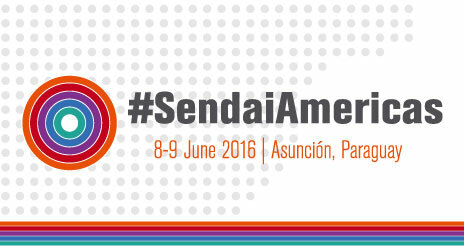 Health is included in the expected outcome and goal of the Sendai Framework. 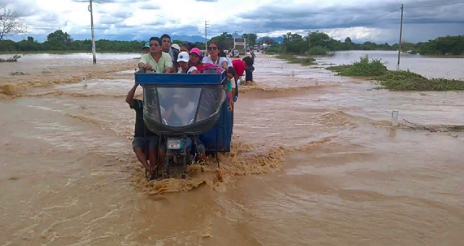 One of the purposes that demonstrates the territorial effort of municipality of Palmira, led by Dr. José Ritter López Peña, is to promote the sense of transformation in the way social actors assume behaviors that lead to increase the capacity of collective resilience against the risk of disasters. 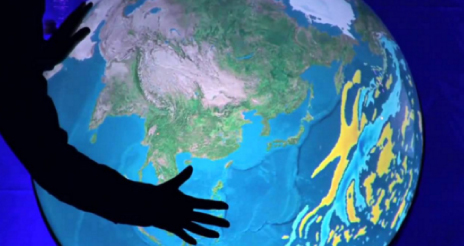 How can science play a bigger part in reducing disaster risk? 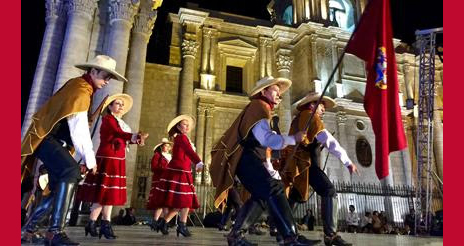 When the Viceroy of Peru, Jose Antonio Mansa de Velasco, was given orders to rebuild Lima after an earthquake in October 1746, he hired the French mathematician, Louis Godin, to come up with a reconstruction plan. 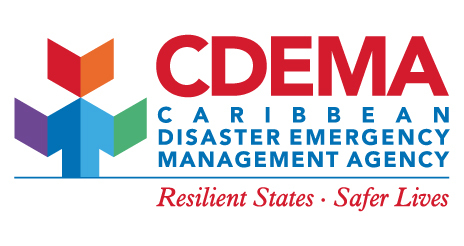 The Caribbean Disaster Emergency Management Agency (CDEMA) has launched an awards scheme for 2016 which seeks to support national and regional efforts to reduce disaster loss and the impacts of climate change. 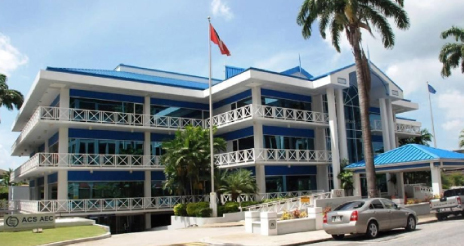 CDEMA includes some of the most disaster prone small island States in the world, exposed to sea-level rise, storm surges, flooding and landslides during the Atlantic Hurricane Season and situated in the so-called Ring of Fire with its network of active seismic fault lines and volcanoes. 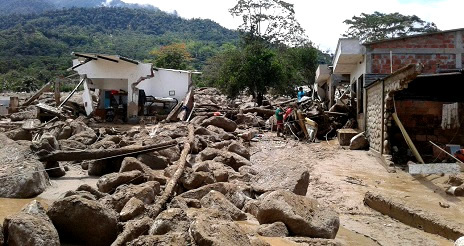 In the face of growing material loss and damage associated with the impact of natural disasters in the region, and the resulting challenge of meeting the development goals; the Government of Panama, through the Ministry of the Interior and the National Civil Protection System (SINAPROC), commissioned the United Nations and strategic partners to carry out the first “Assessment of the Status of Disaster Risk Reduction in the Republic of Panama”. 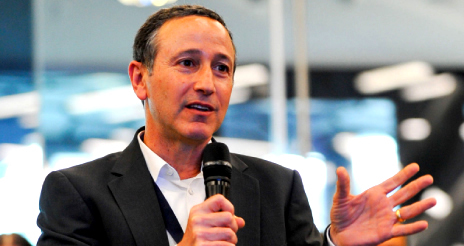 Dr. Robert Glasser, an experienced leader and thinker on development issues, took up his new role this week as head of the UN Office for Disaster Risk Reduction (UNISDR). 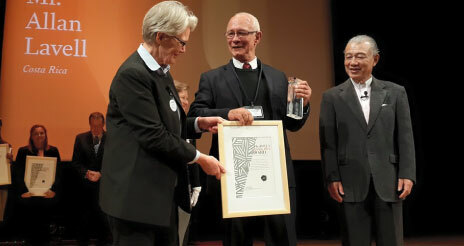 He was appointed as Special Representative of the UN Secretary-General for Disaster Risk Reduction, succeeding Ms. Margareta Wahlström who completed two terms at the end of 2015. 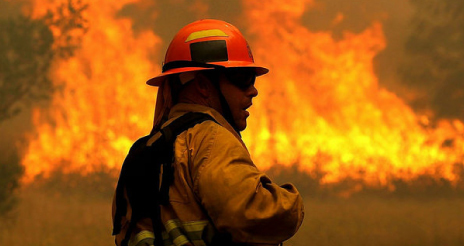 A new report from the US Department of Agriculture highlights the threat of wildfires to a warming, more drought-prone planet and the impact they can have on budgets for forest restoration. 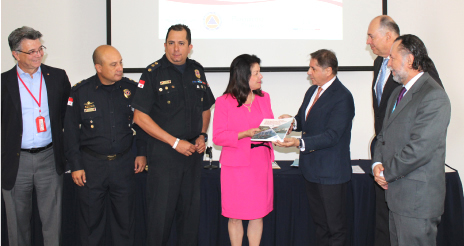 After the constant earthquakes that have occurred in this city located southeast of Mexico, Tuxtla Gutierrez 's government announced that it has come up with a system to provide greater security and confidence to families through Project Early Warning System multi- threat called "Red alert Multi 360”. 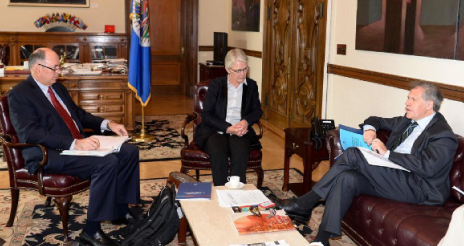 In the wake of the extreme tornadoes that struck the United States over Christmas, freak snowfalls in Mexico and heavy flooding in South America and the United Kingdom, Ms. Margareta Wahlström, head of the UN Office for Disaster Risk Reduction today urged governments to take more prevention actions to reduce human and economic losses caused by weather related disasters. While in North America, cities such as New York and several others in the United States are witnessing the hottest Christmas on record and with extreme flooding and tornados resulting in more than 40 deaths in states such as New Mexico, Texas, Oklahoma, Missouri and Illinois; Mexico is experiencing unusual snowfalls whereas flooding is being faced in the United Kingdom as well as in South America where heavy rains and severe flooding have led to more than 170 thousand people being evacuated in Paraguay, Argentina, Brazil and Uruguay. 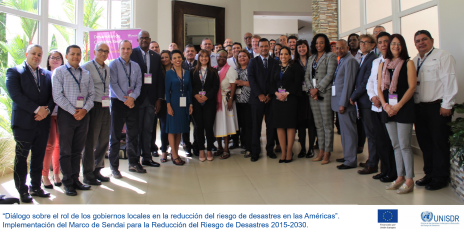 With the aim of increasing social demand and political commitment towards a resilient and sustainable national development that adapts to climate change, the Ministry of the Presidency of the Dominican Republic in coordination with the National Emergency Commission (CNE), led the closing of the "Capacity Building Training Workshop for Making Cities Resilient to Disasters”, held recently in Santo Domingo. 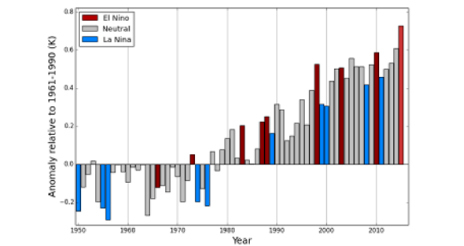 The Americas are paying a high price as one of the worst El Niños on record continues to strengthen. 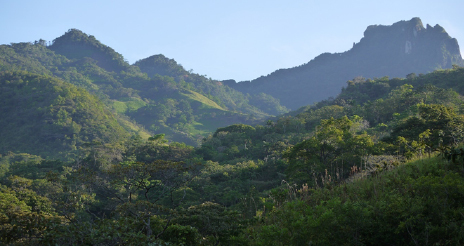 The World Meteorological Organization this week singled out “considerable concern” about the impact of El Niño on the Amazon basin in the context of long-term climate change. On behalf of the United Nations Office for Disaster Risk Reduction (UNISDR) we are pleased to invited you to promote and support the availability and application of science and technology for decision-making in Disaster Risk Reduction by attending this important international event on science and technology. Mayors from the 250-member strong Organization of World Heritage Cities (OWHC) have called for member cities to include protection of cultural heritage in disaster risk management plans as set out in the Sendai Framework for Disaster Risk Reduction. Ten days ago, the news broke that “the strongest hurricane ever recorded in the Western Hemisphere” was about to slam into the Pacific coastline of Mexico. 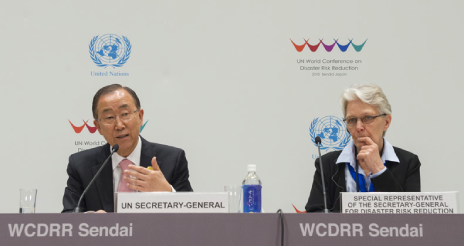 The Head of the UN Office for Disaster Risk Reduction (UNISDR), Margareta Wahlström, today opened the 2015 Pacific Regional Disaster Resilience Meeting amidst fears that El Niño will result in more extreme weather events across the hazard-prone region of small islands and atolls. 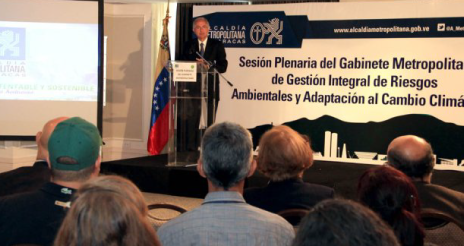 The Metropolitan Government of Caracas is the entity responsible for the coordination and planning of environmental and urban issues for the Metropolitan area of Caracas, which includes the municipalities of Libertador, Chacao, Baruta, Sucre and El Hatillo. National flags are a mark of pride and patriotism in every country around the world. But there is only one flag that belongs to all of us. That blue flag of the United Nations was a banner of hope for me growing up in wartime Korea. 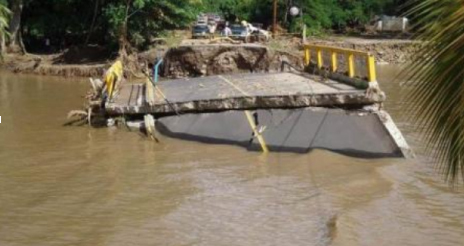 Four out of nine Panamanians think that disaster risk has increased, and inhabitants of Panama Metro attribute this increase to both the construction of housing developments in flood zones and the lack of disaster risk information. 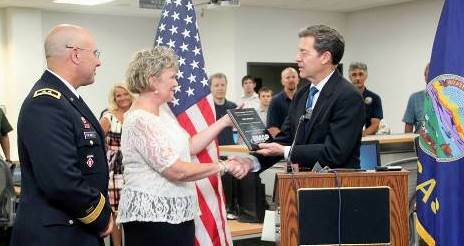 This shows the need for a plan which aims to educate and empower people to take action to face disasters. 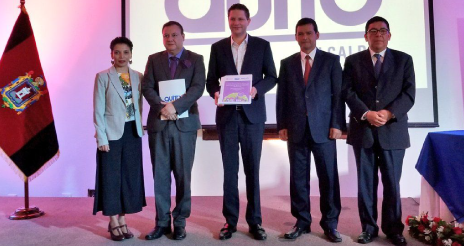 Eight communities living with the threat of floods, storms, earthquakes and volcanic eruptions were today recognised as Champions of Disaster Risk Reduction by the UN Office for Disaster Risk Reduction (UNISDR). 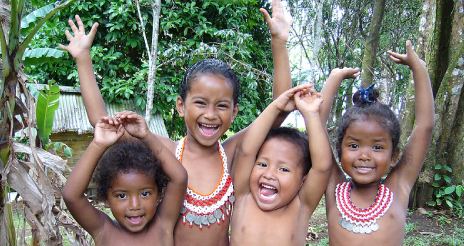 This year’s observance of the International Day for Disaster Reduction is dedicated to the power of traditional, indigenous and local knowledge. 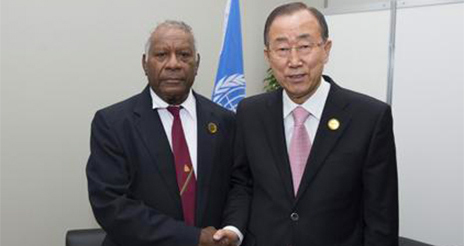 In March 2015 in Sendai, Japan, I met with the President of Vanuatu, His Excellency Baldwin Lonsdale, at the Third UN World Conference on Disaster Risk Reduction. On that very day, his island nation was devastated by Cyclone Pam, one of the strongest storms ever to strike the Pacific. 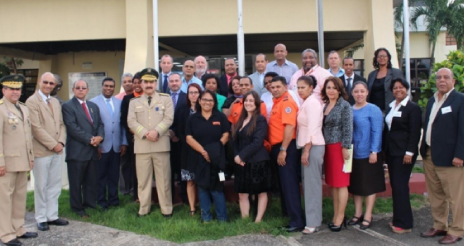 The Association of Caribbean States (ACS) through its Directorate of Disaster Risk Reduction convened the 23rd Meeting of the Special Committee on Disaster Risk Reduction at the ACS Secretariat in Port of Spain on 9th October, 2015. 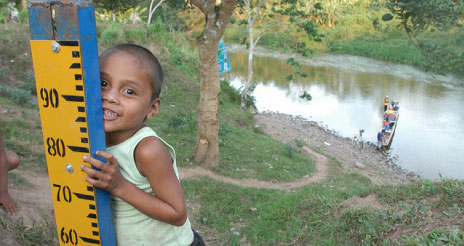 In order to collect information on the ancestral practices of indigenous peoples on issues of risk prevention, mitigation and management, the municipality of Puerto Cabezas, Nicaragua developed the “Socio Cultural Diagnosis on strategies for risk prevention, mitigation and management traditionally practiced among indigenous peoples”. 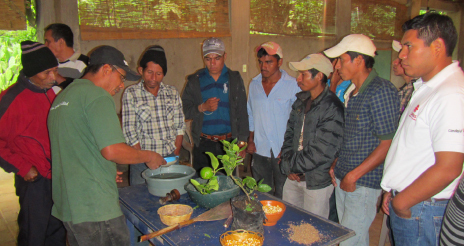 The tiny community of El Solís in rural Guatemala is tapping into its local knowledge on biodiversity and maintaining a native seeds bank to help it cope with drought, food insecurity and climate change. 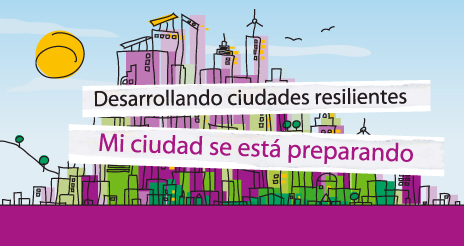 For our district of Carabayllo - Lima, this opportunity to participate in the “My City is Getting Ready” campaign, is critical because it involves actions informed by Disaster Risk Management. We have been working on risk assessment, prevention measures, risk reduction, disaster preparedeness, disaster response, rehabilitation after a disaster and reconstruction of the affected. These actions have been developed since 2011 to the present. To address this increasing concern, the European Commission’s Humanitarian Aid and Civil Protection department (ECHO), jointly with its partners the United Nations Office for Disaster Risk Reduction (UNISDR) and the International Federation of Red Cross and Red Crescent Societies, will be gathering in Santo Domingo, Dominican Republic, from 21st to 23rd September with regional and national stakeholders and promoters of Disaster Risk Reduction (DRR), in a planning workshop. 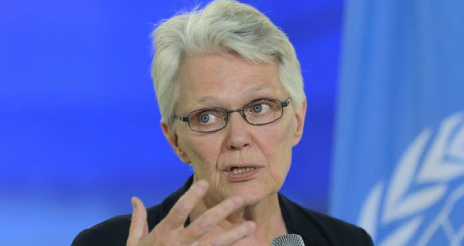 The head of the UN Office for Disaster Risk Reduction (UNISDR), Margareta Wahlström, will take part tomorrow in the 30th anniversary commemoration of the earthquake which struck Mexico City on September 19, 1985. 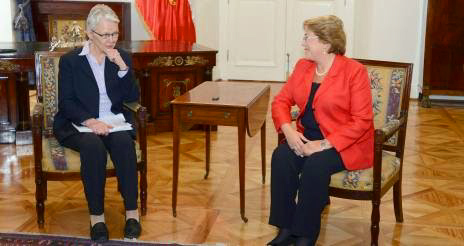 The head of the UN Office for Disaster Risk Reduction (UNISDR), Margareta Wahlström, today congratulated the Chilean government on its successful efforts to reduce disaster risk and minimise the number of casualties from the 8.3 magnitude earthquake and tsunami which occurred last night. 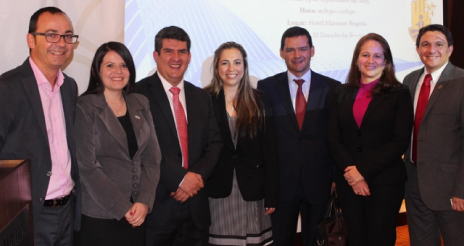 With the objective of consolidating a resilient country against disaster risk through strategic linkages among the public and private sectors, the Colombia National Chapter of the Private Sector Alliance for Risk Sensitive Investment (AR!SE) was launched. With the objective of coordinating actions, efforts, capacities and knowledge to build the resilience of institutions, businesses and communities under the National System for Disaster Risk Management, the “Articulation of the Private Sector on Disaster Risk Management” publication was launched. 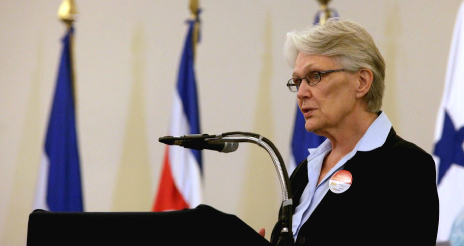 The head of the UN Office for Disaster Risk Reduction (UNISDR), Margareta Wahlström, today extended her condolences to the people of the small island state of Dominica as they enter a second day of national mourning for the 31 people who have died and the 35 reported missing in the wake of a tropical storm which arrived with little or no warning. 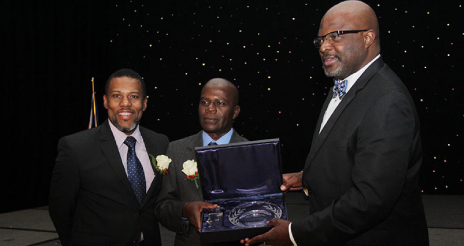 The overall objective of this prestigious award is to promote increased awareness of and to encourage deeper engagement in advancing the Comprehensive Disaster Management approach to disaster risk reduction, including the climate change phenomenon, in the CDEMA Participating States. 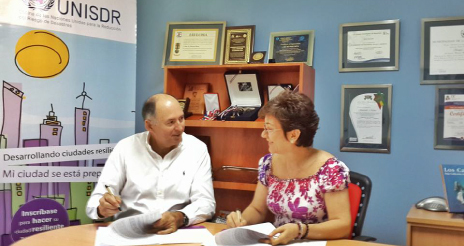 The United Nations Office for Disaster Risk Reduction (UNISDR) and the Colombian NGO Corporation for Risk Management - Solidarity Fund (CorpoRiesgos), have recently signed a Collaboration Agreement to strengthen efforts for the promotion of actions aimed at reducing the risk of disaster and building resilience at the local level in Colombia. 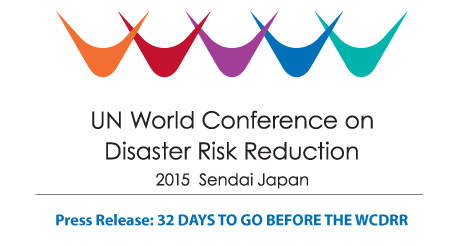 The Sendai Framework for Disaster Risk Reduction 2015-2030, adopted at the Third UN World Conference on Disaster Risk Reduction on 18 March 2015 in Sendai, Japan, calls upon the United Nations Office for Disaster Risk Reduction (UNISDR) to facilitate consultative processes to develop practical guides for implementation. Ms. Wahlström said: “Hurricane Katrina exposed weaknesses in disaster risk management which are common to many hazard prone locations around the world. 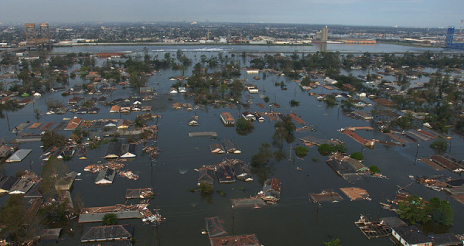 We can learn a lot from New Orleans if we are to achieve substantial reductions in disaster losses as called for in the Sendai Framework for Disaster Risk Reduction which was adopted by governments earlier this year. In the framework of the Global Workshop of Focal Points and Advocates of the Global Campaign “Making Cities Resilient”, twenty advocates of the Campaign as well as staff of the United Nations Office for Disaster Risk Reduction (UNISDR) from 18 countries in Africa, the Arab States, Asia, Europe and the Americas, proposed measures to enhance the dissemination, relevance and implementation of the campaign and its New Ten Essentials, such as the development of Resilient Cities. 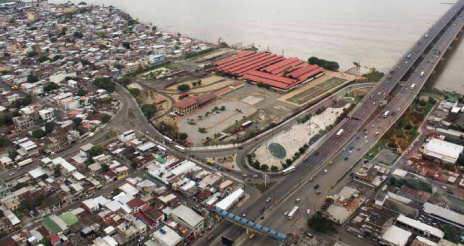 The United Nations Office for Disaster Risk Reduction (UNISDR), through its Regional Office for the Americas, and the Municipality of Bugaba, Panama signed a Partnership Framework for advancing the sustainable and resilient development of the municipality, based on the Global Campaign “Making Cities Resilient: My City is Getting Ready ", promoted by UNISDR since 2010. 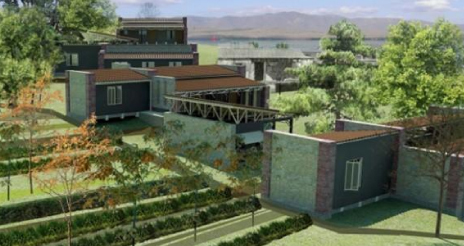 Put in place by Architecture students from the Central University Marta Abreu de las Villas, the project Rescate de Cayo Gramma, in Santiago de Cuba, received one of the two awards given throughout the VII International Competition of Architecture for Disaster Risk Reduction, with its headquarters in London, United Kingdom. The United Nations Office of the High Representative for the Least Developed Countries, Landlocked Developing Countries and Small Island Developing States defines small island developing states, or SIDS, as “a distinct group of developing countries facing specific social, economic and environmental vulnerabilities”. These countries are across the globe in the Caribbean, the Pacific, Atlantic and Indian Oceans, and the Mediterranean and South China Sea. 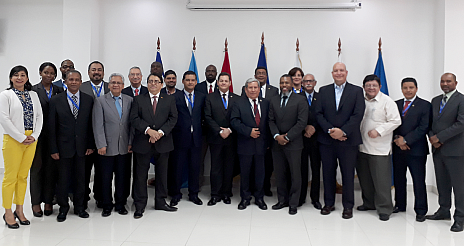 Experts from the region of the Americas pledged to help meet the expected outcome, scope, purpose, priorities for action, goals and guiding principles of the Sendai Framework for Disaster Risk Reduction 2015-2030, adopted last March by the Member States of the United Nations in Sendai, Japan. The UN Office for Disaster Risk Reduction (UNISDR) today launched a search for communities that demonstrate excellence in managing disaster risk in order to draw attention to the importance of local knowledge, traditions and customs in the struggle against extreme weather events, climate change and earthquakes. 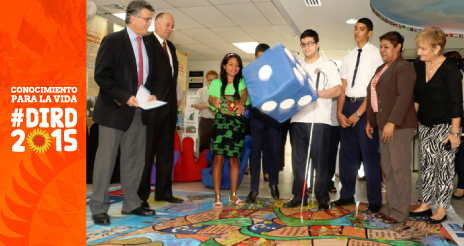 Print edition of Handbook on Emergency and Disability launched: A result of the cooperation between countries of the Americas that inspires projects throughout the continent. With the aim of conducting a process of institutional strengthening on the principles of protection and support the actions of relevant bodies on issues of disaster risk reduction to promote the protection of the most vulnerable people at the territorial level, starting in July 2014, the regional project “Protecting vulnerable groups in Central America through the inclusion of protection principles in preparedness and response” is being implemented in Guatemala in the framework of the IX DIPECHO Project 2014-2015. 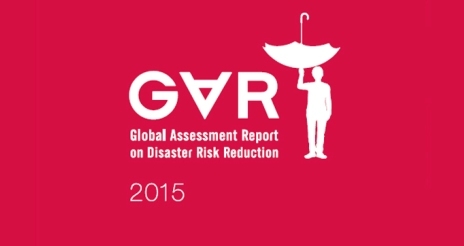 The United Nations launched today in Lima the Spanish version of the Global Assessment Report on Disaster Risk Reduction 2015 (GAR) prepared by the United Nations Office for Disaster Risk Reduction (UNISDR). 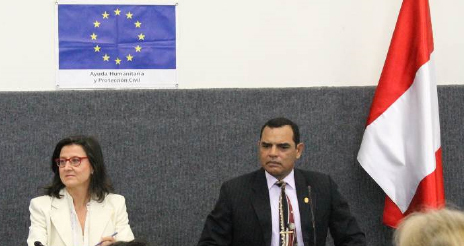 The launch ceremony, organized jointly by the UN and the Presidency of the Council of Ministers (PCM), was led by Maria Luisa Silva, UN Resident Coordinator in Peru and Manuel Mesones, Secretary General of the PCM. In the words of the mayor of the municipality of Duran, Ecuador, Alexandra Arce Pluas: The participation in the Campaign is our commitment to strengthening our capacities (technical, social and cultural), to address climate change, to be a resilient territory and to achieve a replicable process in others cities to ensure “Good Living”, so that it may be carried out under similar conditions and with similar objectives. 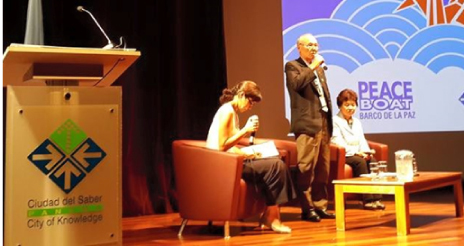 As part of the 70th anniversary of the creation of the United Nations, of the 70 years of the atomic bombings of Hiroshima and Nagasaki and the arrival of the NGO Peace Boat at the Port of Colon, Panama; a Forum of testimonies was held with atomic bomb survivors (Hibakusha in Japanese), who shared their experiences of personal resilience after succeeding to overcome such a tragic event. 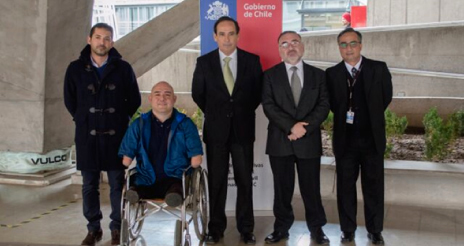 The NGO Inclusiva, winner of the 2014 Risk Award”, alongside the Under Secretary for Coordination of Policy Integration of the Province of Buenos Aires, Argentina and the Provincial Council on Disability (COPRODIS) of the Province of Buenos Aires presented the “Inclusive Plan for Emergency and/or Disaster Situations” (PISEC), which provides for the coordination of actions for disaster risk reduction with an inclusive approach involving local governments, organizations of and for disabled people and the government of the province of Buenos Aires.adaptation and mitigation of climate change. Approximately 900 million people live in mountain areas in the world and another large part of the population in cities located downstream who depend on vital services provided by mountain soils for food production, biodiversity, and adaptation and mitigation of climate change. "Don’t be part of the problem, be part of the solution. Become Resilient! '' 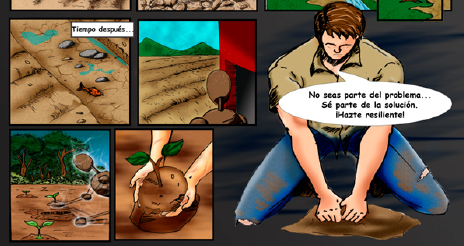 is the proposal from the Volunteer Network of Professionals for Resilience in Nicaragua, which use comics and visual language to present everyday situations to convey that disasters are not natural but a result of a collective failure as a community to cope with natural hazards. 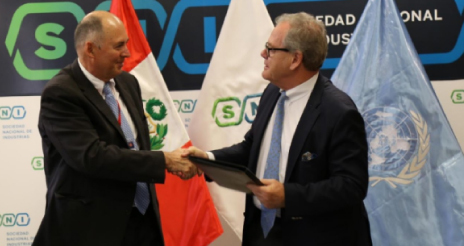 The European Union granted 2.5 million euros to Peru to strengthen the National System for Disaster Risk Management (SINAGERD), in order to prepare the most vulnerable populations in the different regions of the country and implement disaster response measures. 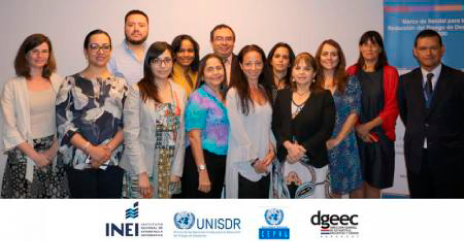 The United Nations Office for Disaster Risk Reduction (UNISDR) through its regional office for the Americas is carrying out a call for good practices throughout Central America and the Caribbean on integrating gender and women empowerment in Early Warning Systems (EWS). 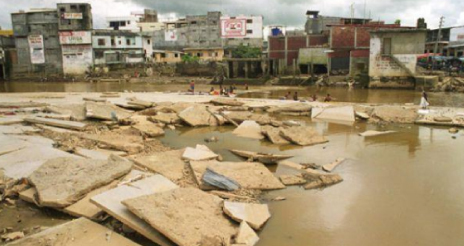 In 2005, following the effects of a tornado - a rare event in the region - the administration of Indaiatuba / SP / Brazil understands that resilience requires that all actions be aimed at human development, beyond the collective welfare. 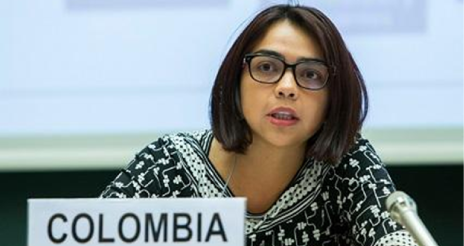 Within the theme “Towards Sustainable Development: The Future of Disaster Risk Management”, the United National Disaster Risk Reduction Office in Colombia published the Global Assessment Report on Disaster Risk Reduction 2015 (GAR). 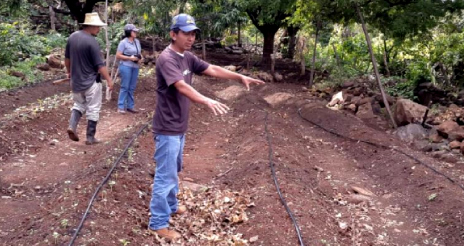 This month, the United States Agency for International Development/Office of Foreign Disaster Assistance Abroad (USAID/OFDA) newsletter highlights the programmes implemented in the field in Latin America, in collaboration with local programmes and in preparation for the hurricane season. 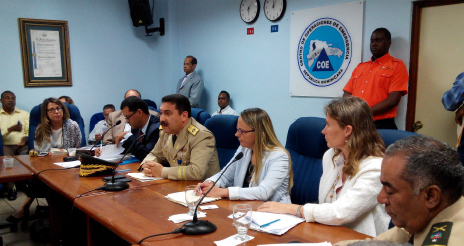 The main objective of the May and June workshops is to contribute to the development and optimization of national development priorities that incorporate comprehensive disaster risk management in the framework of existing policies and with the support of international cooperation. 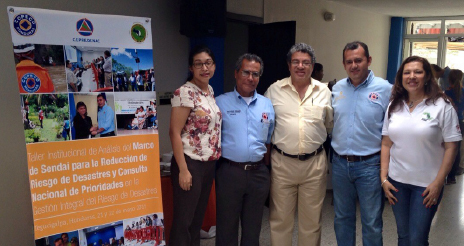 These workshops are being held in Central America to discuss the strategic lines of the recently adopted Sendai Framework for Disaster Risk Reduction 2015 to 2030 (SFDRR) and its links with the priorities identified. 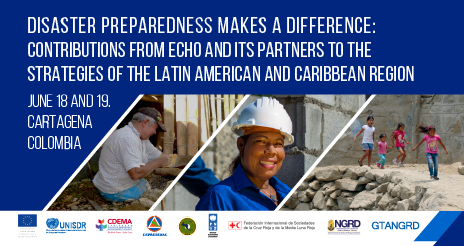 More than 80,000 people in the Dominican Republic will benefit from over $2.7 million in investment through the Disaster Preparedness Programme (DIPECHO) 2015-2016 to reduce the impact of natural hazards by preparing vulnerable populations and the strengthening of state institutions in disaster risk management issues. 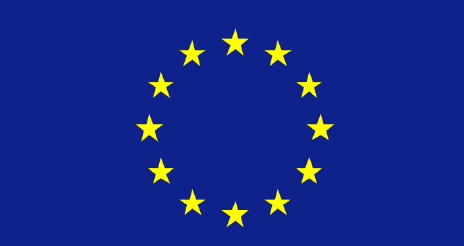 The European Union has allocated 10 million dollars (9.33 million euros) for risk reduction activities in the Caribbean. Communities highly exposed to floods, hurricanes, tsunamis and earthquakes will benefit from disaster preparedness projects funded by the European Commission's Humanitarian Aid and Civil Protection Department (ECHO), through its DIPECHO Programme (Disaster Preparedness ECHO). A total of 14 projects will be implemented in the region between 2015 and 2016 in order to reduce the vulnerability to natural hazards and to better prepare communities and authorities to respond to emergencies. An invitation to the leaders of local governments to reaffirm their commitment to the sustainable and resilient development of their communities in disaster situations, in order to contribute to the development of their competencies (knowledge, skills, etc.) and management skills (organization, regulatory frameworks, etc.) on issues related to disaster risk reduction. 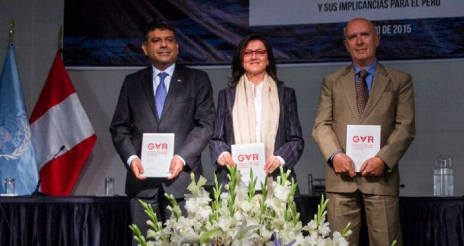 The Declaration of Guatemala, product of the “VII Meeting on International Mechanisms of Humanitarian Assistance (MIAH)”, included a reference to the Sendai Framework for Disaster Risk Reduction 2015-2030 (SFDRR) as a global reference for comprehensive risk management on the post-2015 developmental agenda. Prefeitura de Manaus. 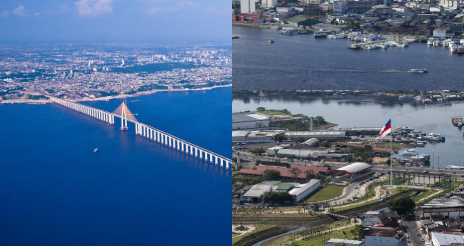 For the city of Manaus, Brazil, its participation in the campaign is seen as an opportunity to strengthen the work of reducing the risk that the municipality anticipates and to exchange experiences with stakeholders at national and international level. 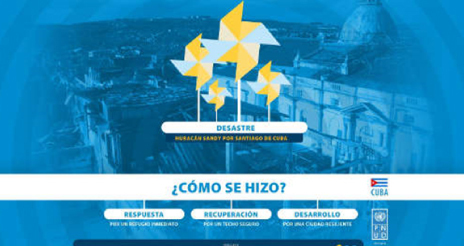 Two and a half years after the impact of Hurricane Sandy in Santiago, the second most important province of Cuba, the United Nations Development Programme (UNDP) in Cuba in collaboration with the Faculty of Construction of the University of Oriente, developed the multimedia application "The Recovery of Santiago de Cuba after Hurricane Sandy " based on the premise that learning from this experience is key to strengthening resilience.. The British Virgin Islands; the States of Arkansas, Arizona, Nebraska and Connecticut; the USACE Kansas City and Seattle Districts; the Commonwealths of Kentucky and Pennsylvania; the Dixie County, Fla., Montgomery County, Md. and Saint Charles Parish, La. 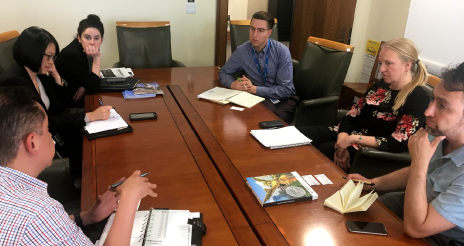 ; and the Idaho State University Programs have earned accreditation by the Emergency Management Accreditation Program (EMAP). 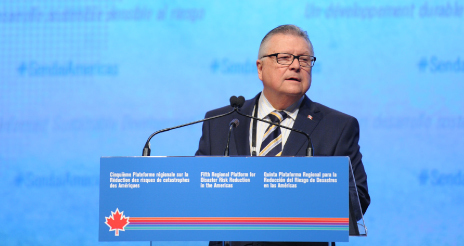 The ministry of Public Safety and Emergency Preparedness of Canada launched the first call for proposals within the CAD$ 200 million (approx. 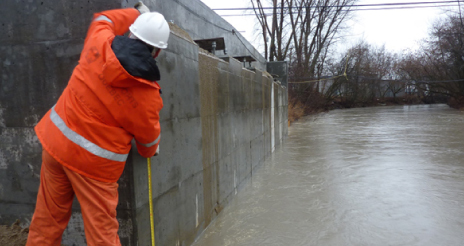 US$ 165 million) National Disaster Mitigation Program (NDMP), as part of the Government’s commitment to build safer and more resilient communities. 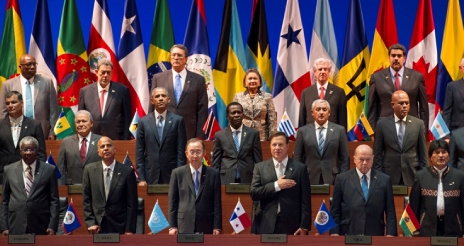 The Secretary-General of the United Nations, Ban Ki-moon urged the presidents and heads of state of the Americas to continue their efforts to eradicate poverty, reduce inequalities and promote development, as he reiterated the commitment of the organization to accompany and support countries in meeting the challenge of further progress in the pursuit of prosperity, during the opening ceremony of the VII Summit of the Americas held in Panama City, Panama. 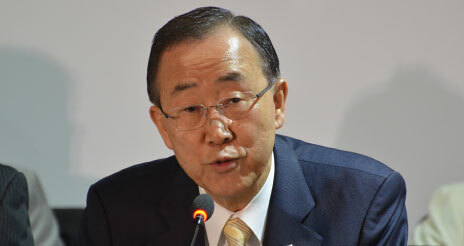 Ban Ki-moon, Secretary-General of the United Nations, will meet this Friday with regional and national UN personnel based in Panama, to exchange ideas on the future of the organization and its impact on the development of the Americas, within the framework of his participation at the VII Summit of the Americas. 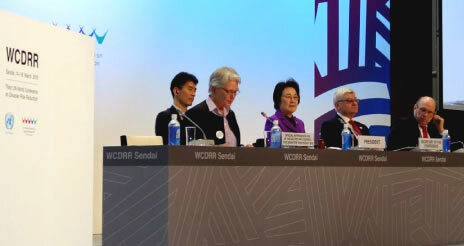 The Third UN World Conference on Disaster Risk Reduction (#WCDRR), is being hailed by participants as the first international meeting of its kind to provide a wide range of accessibility features for people living with disabilities. As a result, more than 200 persons with disabilities are actively participating in the Conference proceedings as delegates, speakers, panellists, and contributors. 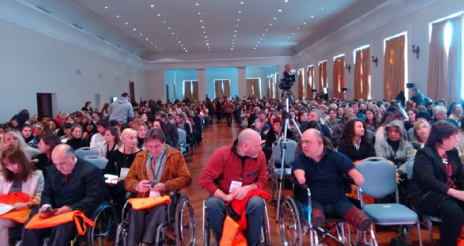 Thirty-four events from the Official Conference Programme and Public Forum address issues of disability. The five-day Conference closes today. Representatives from 187 UN member States today adopted the first major agreement of the Post-2015 development agenda, a far reaching new framework for disaster risk reduction with seven targets and four priorities for action. 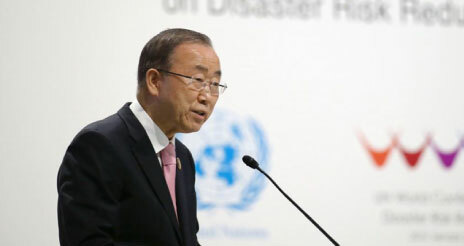 The UN Secretary-General, Ban Ki-moon, today opened the Third UN World Conference on Disaster Risk Reduction, stating that annual economic losses now exceed US$ 300 billion annually. “We can watch that number grow as more people suffer. Or we can dramatically lower that figure and invest the savings in development. 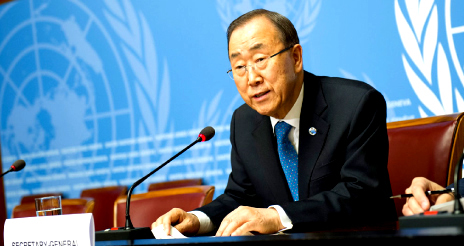 Six billion dollars allocated each year can result in savings of up to US$360 billion by 2030, the Secretary-General said. 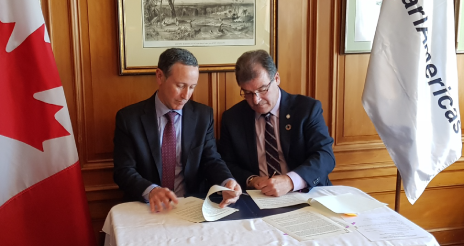 The UN Office for Disaster Risk Reduction (UNISDR) today agreed to help pioneer a new ISO Standard in 45 cities already recognized for their commitment to keeping their citizens safe from a range of natural hazards including floods, storms and earthquakes. 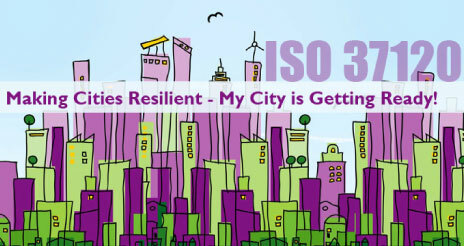 The new ISO standard for resilient and sustainable cities – ISO 37120 – is based on 100 indicators which steer and measure the performance of city services and quality of life. It is being implemented by the Toronto-based World Council on City Data (WCCD). 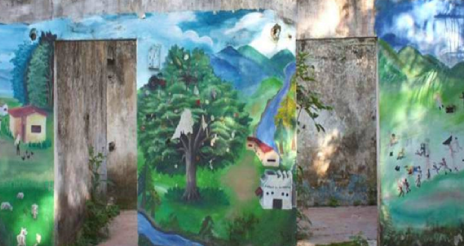 For the municipality of Nocaima, Cundinamarca - Colombia, participation in the campaign is an opportunity not only to raise awareness of our ongoing efforts against to build resilience in our population, but also an opportunity to share knowledge and actions to strengthen our work in Nocaima´s community. 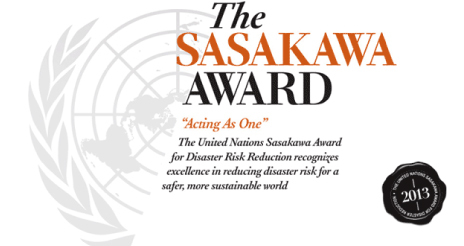 The judges of the 2015 United Nations Sasakawa Award for Disaster Reduction have today announced their final short-list of three. 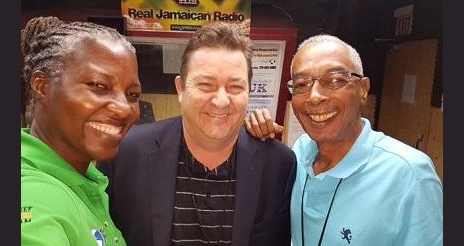 The nominees are Allan Lavell, a disaster risk researcher and consultant based in Costa Rica; the Australian Business Roundtable for Disaster Resilience and Safer Communities; and the Jeffrey Town Farmers’ Association of Jamaica. The United Nations Office for Disaster Risk Reduction has designated the City of Hoboken, New Jersey, USA, as a Role Model City of the Making Cities Resilient campaign for its flood risk management practices. 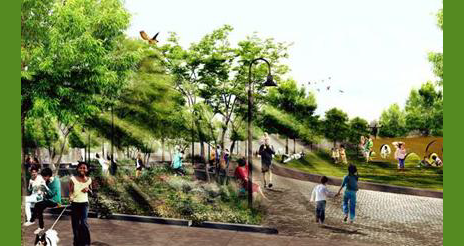 These include plans to retain over a million gallons of stormwater runoff through green infrastructure. Margareta Wahlström, the UN Head of the Office for Disaster Risk Reduction (UNISDR) met yesterday with the Prime Minister of Japan Mr. Shinzo Abe in Tokyo and discussed with him the preparations for the next UN World Conference on Disaster Risk Reduction that will be hosted by Japan in Sendai from 14 to 18 March. 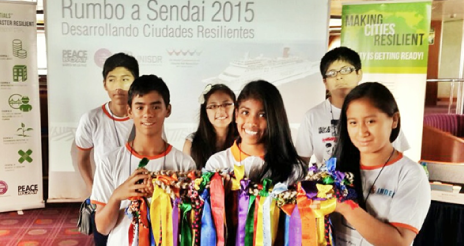 Peace Boat arrived in Callao port to receive proposals from Peruvian children and youngsters to be later taken to the III United Nations World Conference on Disaster Risk Reduction (WCDRR) to be held in Japan. Peace Boat's goal is to share experiences with Japan at a regional level, in order to promote commitments through the production of resilience for the next world conference. With the conviction that strengthening resilience is key to the sustainable development of the region, experts from Brazil, Colombia, Costa Rica, Chile, Honduras, Nicaragua, Uruguay and Japan will discuss proposals and challenges in this area, during the 86th Global Voyage organized by the Japanese NGO Peace Boat, arriving at ports of Valparaiso, Chile and Callao, Peru. The regional meeting is part of the international actions that are taking place in preparation for the Third United Nations World Conference for Disaster Risk Reduction (#WCDRR) to be held in Sendai, Japan, from 14 to 18 March, and will provide the opportunity for Latin America and Japan to share experiences on the advances and challenges in the region on both disaster risk reduction strengthening resilience from community level and involving all sectors. 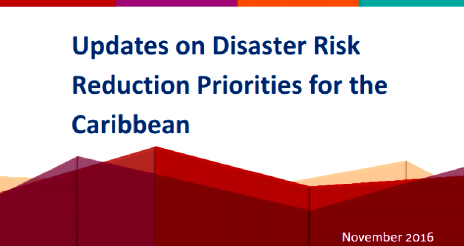 The Latin America and Caribbean regional office of the U.S. Agency for International Development’s Office of U.S. Foreign Disaster Assistance (USAID/OFDA), published the “Hazard-specific Disaster Risk Reduction Implementation Guide”, intended to guide analysis of which USAID/OFDA sectors and sub-sectors may be most relevant to reducing risk related to an identified hazard in the programme location. As set out in USAID/OFDA’s DRR conceptual framework, the broad context of the area exposed to a given natural hazard, and the capacities that exist within that area, will also serve to guide the development of appropriate DRR programmes. 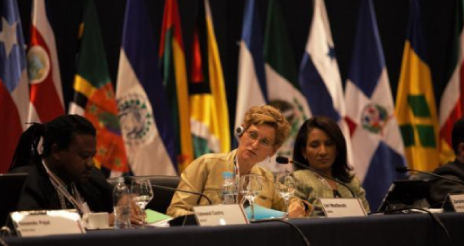 The United Nations Office for Disaster Risk Reduction (UNISDR), through its Regional Office for the Americas, published the ‘Proceedings of the Fourth Session of the Regional Platform for Disaster Risk Reduction in the Americas,’ a document which includes among other things, the progress and challenges of the region in resilience building and disaster risk reduction, as well as key contributions to the new post-2015 disaster risk reduction framework, which will be approved during the Third United Nations World Conference on Disaster Risk Reduction (Sendai, Japan, 14 to 18 March, 2015). 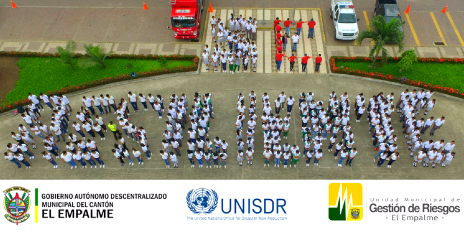 The United Nations Office for Disaster Risk Reduction (UNISDR) recognized the “Risk Management and Climate Change Information System (SIRE)” in Bogota, Colombia, and the “Civil Defence Information System (SIDS)” of Parana, Brazil as the most innovative in support of local development sensitive to disaster risk and climate change adaptation. They will be presented at the World Conference on Disaster Risk Reduction (WCDRR) to be held in Sendai, Japan from 14 to 18 March. 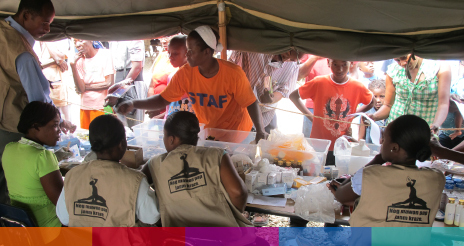 In its December newsletter, the Office of U.S. Foreign Disaster Assistance of the United States Agency for International Development (USAID/OFDA) highlights its disasters risk reduction (DRR) projects in vulnerable areas of Haiti, Peru, Jamaica and Colombia, which were recently awarded US$ 9.6 million. As the year comes to an end, it is time to not only highlight this year´s achievements, but to assess the challenges, and draw a strategic course toward a historical 2015; where key events such as the United Nations World Conference on Disaster Risk Reduction will contribute to a new global framework for community resilience to be widely recognized as a priority for sustainable development, for which new objectives will be agreed in 2015, as will a global agreement regarding climate change. 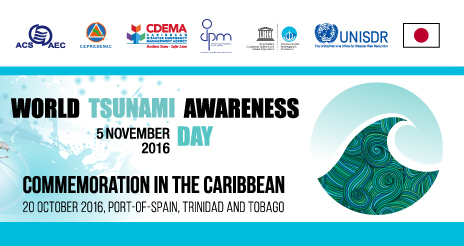 Preventionweb is launching today the Guest Editorial titled "The importance of tsunami early warning systems for human security". This theme bears a very special connotation as exactly 10 years have passed since the 26 December 2004 Indian Ocean Tsunami. As you know, in many places remembrance events will take place. 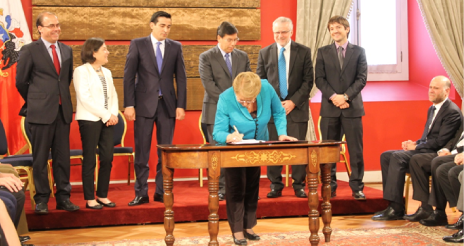 Chilean president, Michelle Bachelet, signed the bill that will replace the National Emergency Office by the National Risk and Emergency Management Service, which will be responsible for planning, coordinating, advising and supervising all institutions in this area. 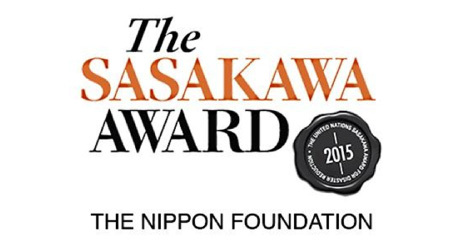 The 2015 Sasakawa Award has generated a huge response with 88 nominations of individuals and organizations received from a remarkable 44 countries. And the four judges – from Africa, the Americas, Asia, Europe and Oceania – have taken the first important step by announcing their first long list of 33 nominations that remain in contention for the prestigious award. The full list still under consideration is found below. 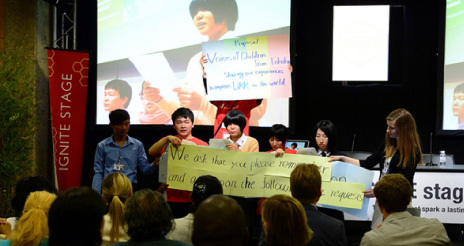 Apply to IGNITE Stage at WCDRR now! 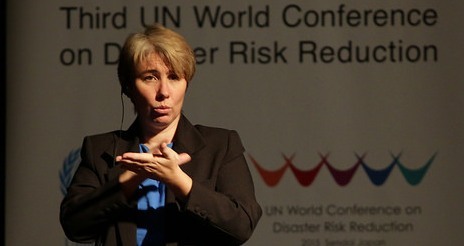 The IGNITE Stage is a special venue where WCDRR participants are allowed 15 minutes to present a disaster risk reduction topic, project or initiative. 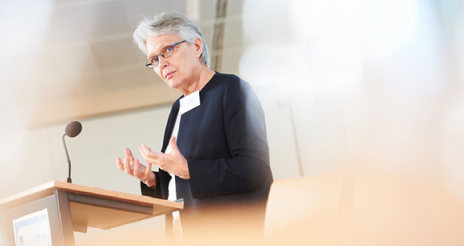 Its aim is to widen the array of topics that are discussed at the World Conference beyond those that are presented in the main sessions and events. 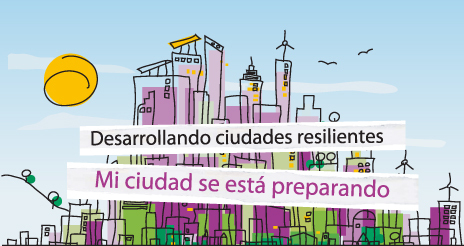 This space is dedicated to promote the work of the local governments participating in the Global Campaign "Making Cities Resilient: Mi City is Getting Ready". Every month, experiences on how local governments deal with risk management in the Americas will be presented. 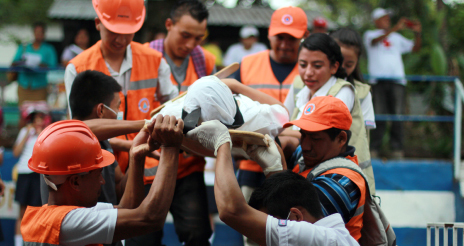 The impact of disasters in Central America is growing despite government efforts to address disaster risk reduction. This is due, among other things, to the lack of investment and rapid population and urban growth. 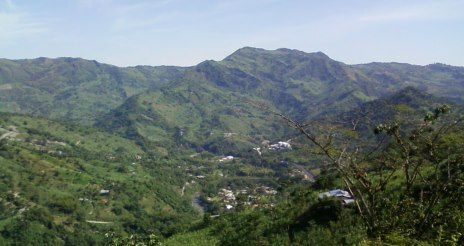 In countries like Panama, there is an increased risk of disasters primarily in provinces like Panama, Veraguas, Chiriqui, Colon and Cocle. 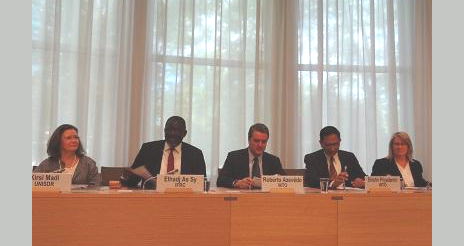 A sustainable development approach could therefore reduce the impact of disasters in the region. 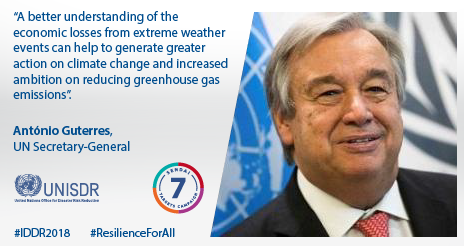 The High-Level Panel will reflect on how a range of financial mechanism could unlock action for building resilience by supporting the implementation of disaster risk reduction (DRR) and climate change adaptation (CCA). The Panel will introduce opportunities to make financial resources available through dedicated funds, risk transfer mechanisms, national budget processes and providing incentives for private sector investments, and will examine the relevance of the post 2015 framework for disaster risk reduction as a support to guide implementation. 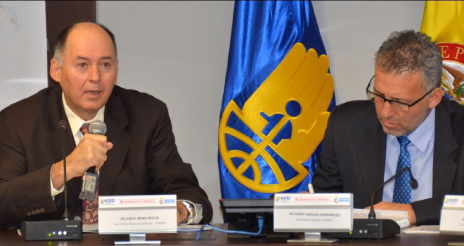 More than 50 experts in disaster reduction and management in the Caribbean will gather from October 16th to 17th in Montego Bay, Jamaica, to promote disaster risk reduction in the region through the exchange of knowledge and experiences.